A little bird whispered in my ear that Moira was approaching (or has approached) a significant birthday. 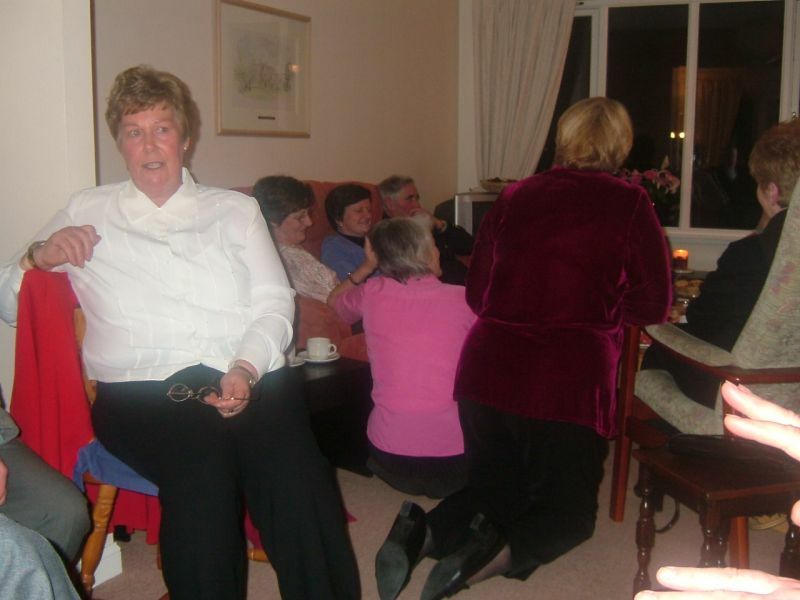 An eCast was sent to all members, except Moira, of course, to advise them of the surprise. 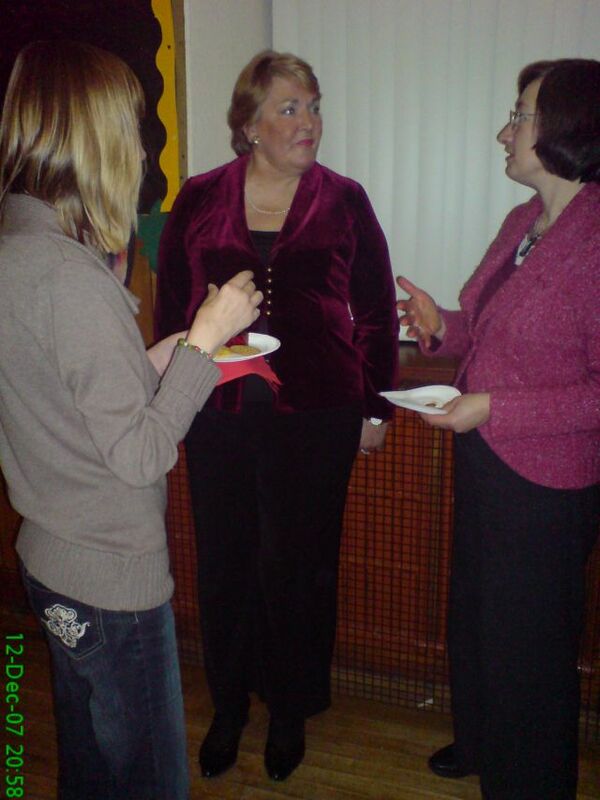 Thanks to Dr Noel, I am uploading some pictures of the event, hopefully thoroughly surprising Moira. As a fellow Piscean (Yes it was my birthday last week! ), I send her my personal congrats. 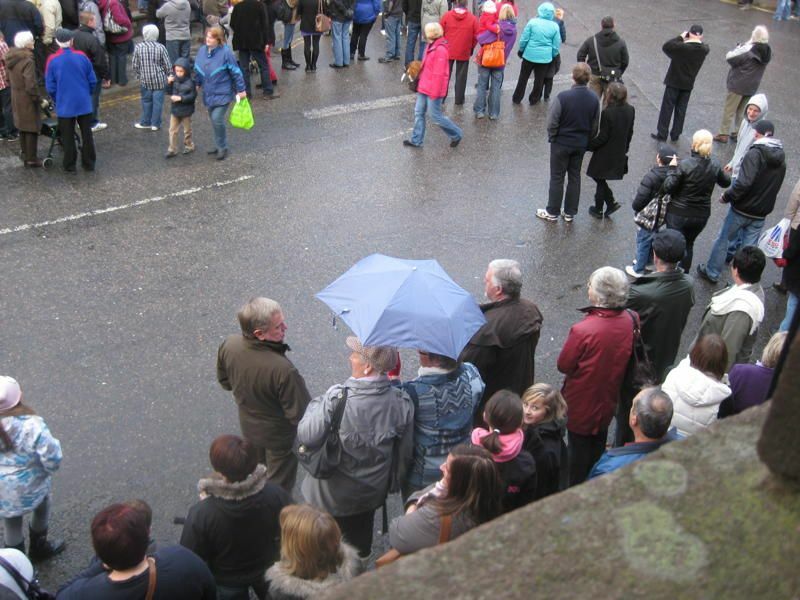 "I am sure Robert Burns would have penned a sharp piece about clashes of dates had he our experience in 2018. 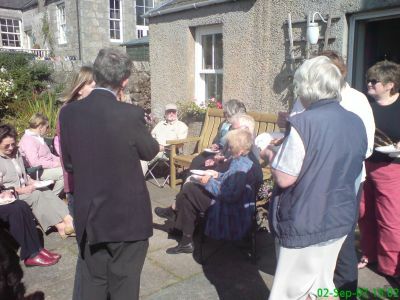 The popularity of Burns Suppers nowadays is seen in the number of events on or around his birthday. 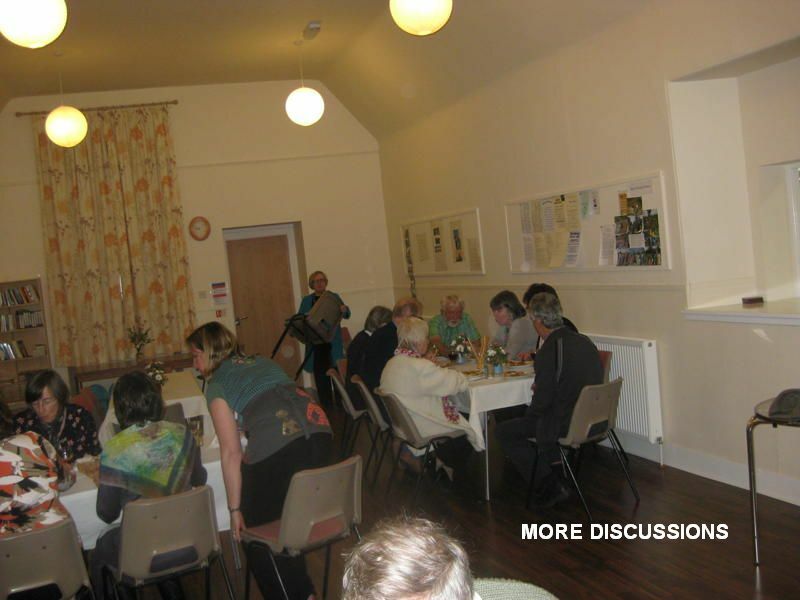 I had pencilled in the event originally planned for 26th Jan in Turriff – the 181st Turriff Burns Supper, when some of the speakers found they were double booked. 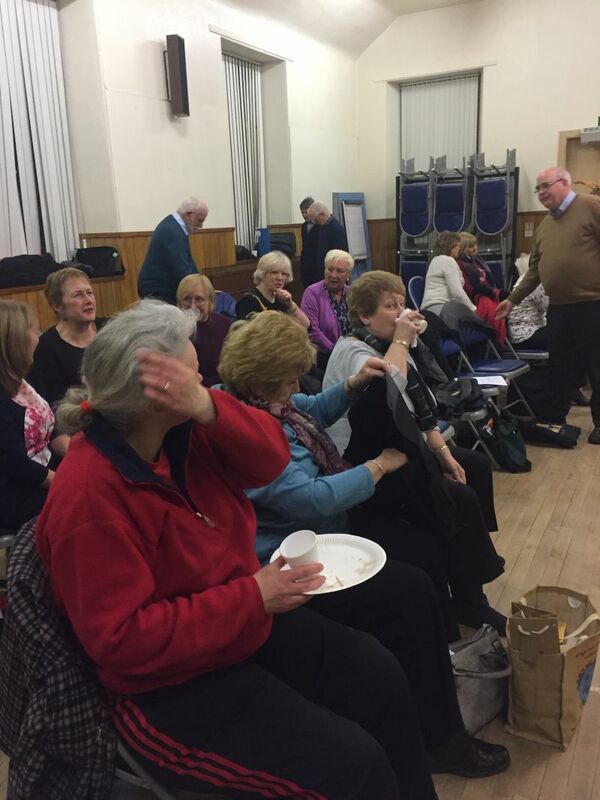 So the Inverurie Choral Society settled for the 2nd Feb – only for the Turriff Group to change their date! 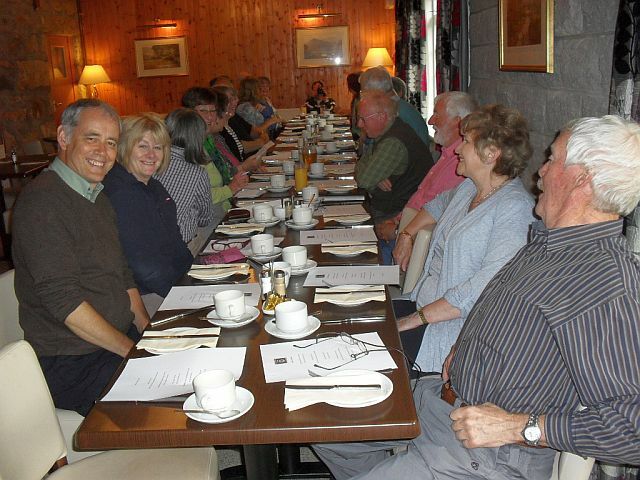 Anyway the Choral Society met at the Kintore Arms, Inverurie and the party of nearly fifty singers and friends had a truly great evening. All the speakers were home grown and though they were amateur in the best sense, they were all very good and even more importantly really entertaining. 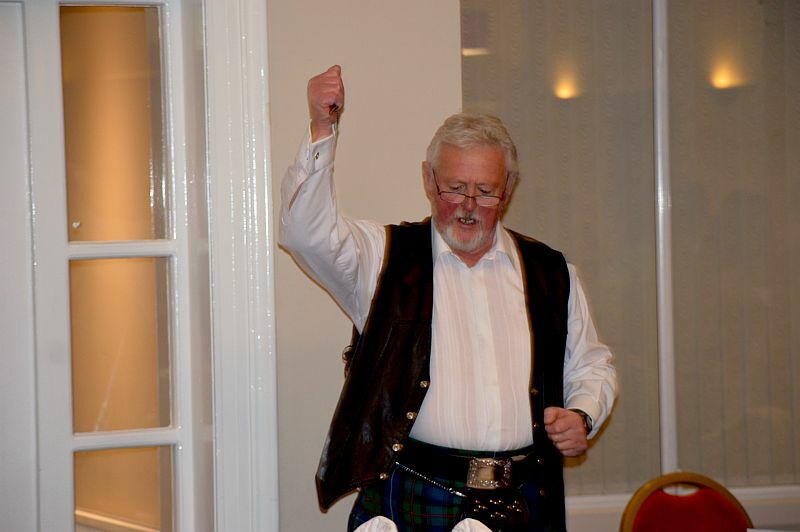 Dr Mike Radcliffe chaired the meeting and the Haggis was piped in by young piper Robert Howie. 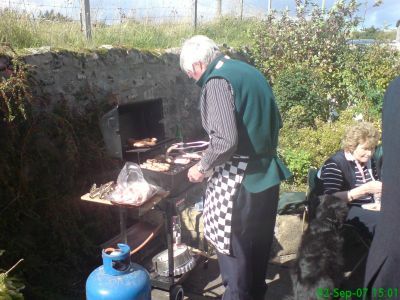 The important task of bringing it in fell to Colin Dean of Turriff – who in his day was a proper cook. 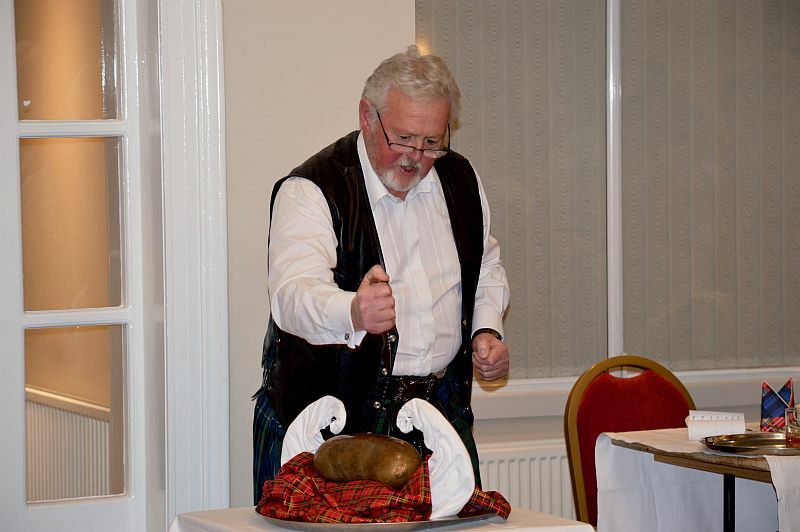 It really was a family affair, and the husband of Alto Anne Robertson took the serious job of addressing the Haggis. 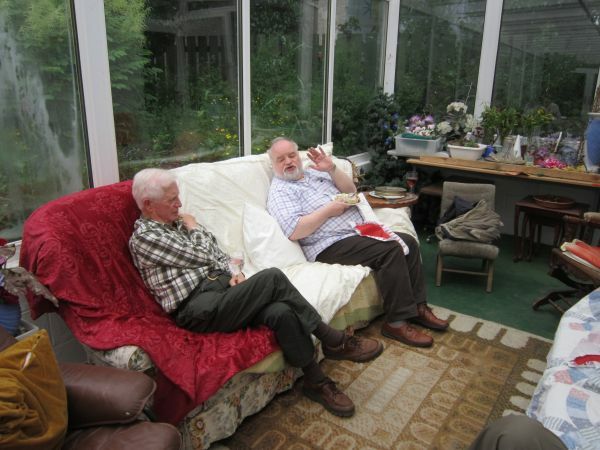 Derek looked and acted suitably fierce waving his knife with real abandon. 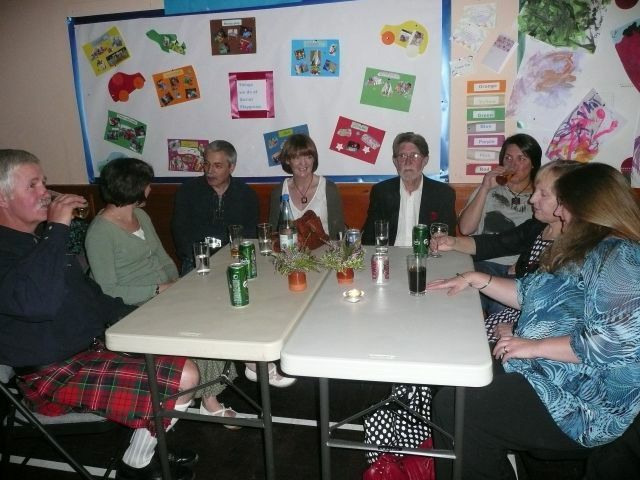 Their daughter Fiona Spence then replied on behalf of the haggis, and Anne proceeded to recite the Selkirk Grace. 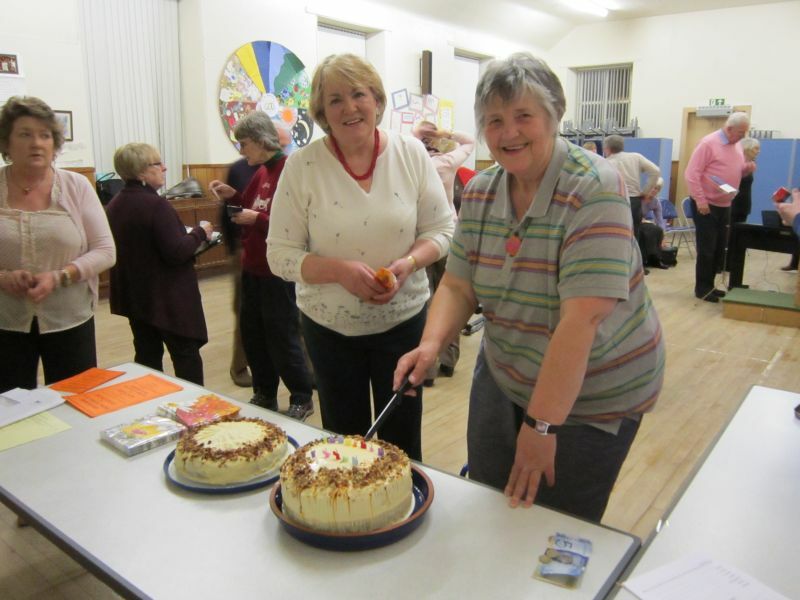 In between the various eating courses the four sections of the Choir, Sopranos, Altos, Tenors and Basses then did their party pieces – all love songs of course. The Sops sang “Ae Fond Kiss”, with the two tenors (tenors are always scarce in Choirs), responding with "My Love is like a Red Red Rose”. If we were not well awake then the boisterous Basses made sure we soon were with “My love is but a lassie yet”. 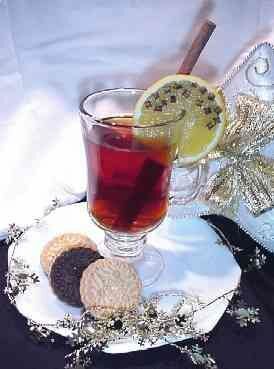 The great speeches on these occasions are of course the Immortal Memory and Toast To The Lassies. 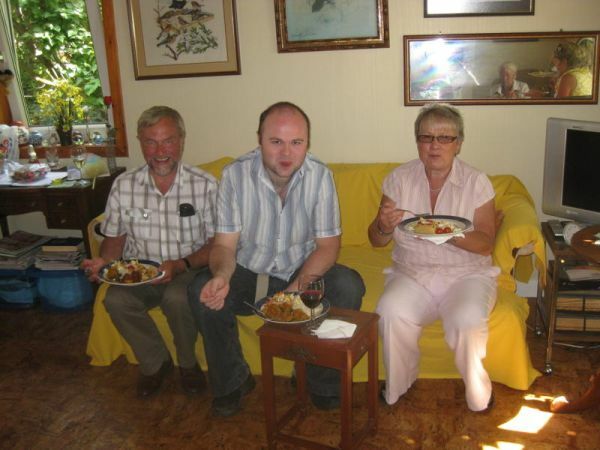 Alan Grant started his Toast in impeccable French, before realising the monoglot audience he actually had. Then without any perceivable notes he launched into a paean of praise to the distaff side. 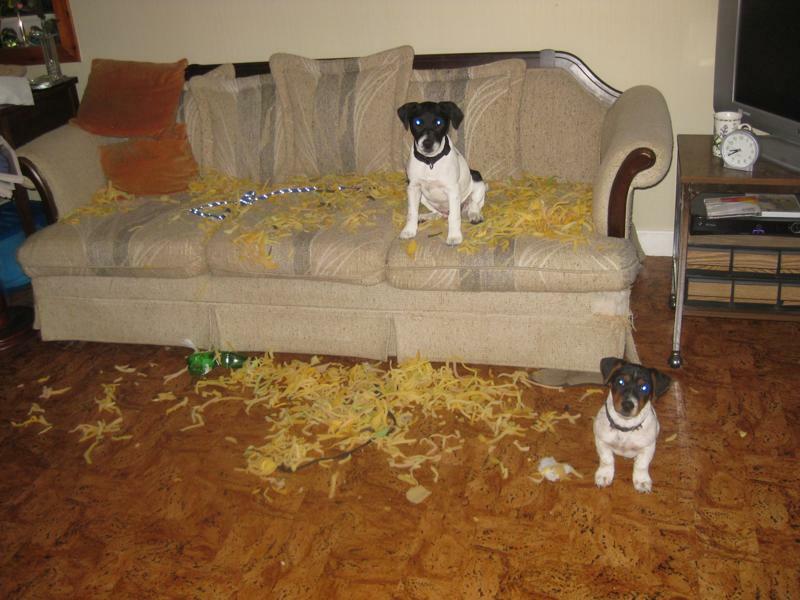 It really was funny and never naughty! Jill Bruce stole the reply from Burns parodying his great call. “A Woman's a Woman for a that!” it was clever and teasing. There is an old saying, “it takes one to know one!”, and when Neil Warner launched into the Immortal Memory, he spoke as a former Excise Man, and in that capacity was able to relate to Burns a similar professional. All these speeches benefit if they impart new knowledge or nuggets of information. Who in the room was acquainted with promiscuity in relation to visits and the Exciseman? 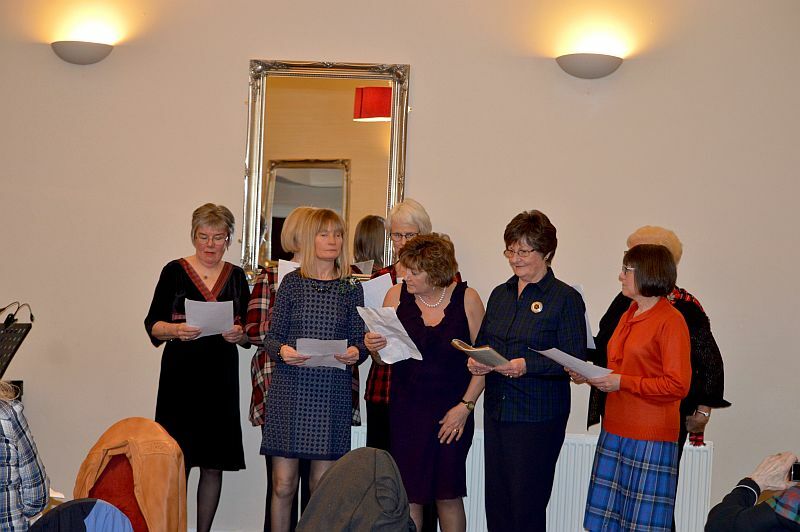 The Inverurie Choral Society were made so this evening. It is worth looking up the origins of the word in an encyclopedia! 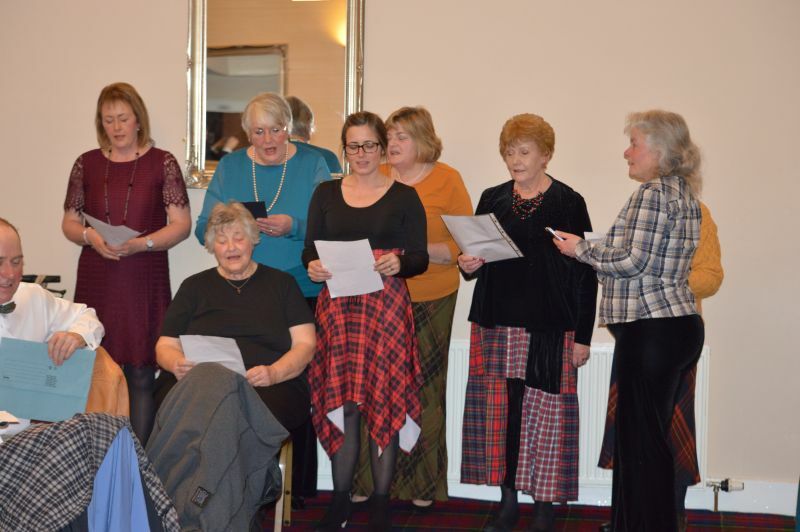 Before the company completed a very difficult quiz on the Bard and his times, the Altos sang “Ca the yowes to the knowes”, and the evening concluded with communal singing of several well kent Scottish songs. 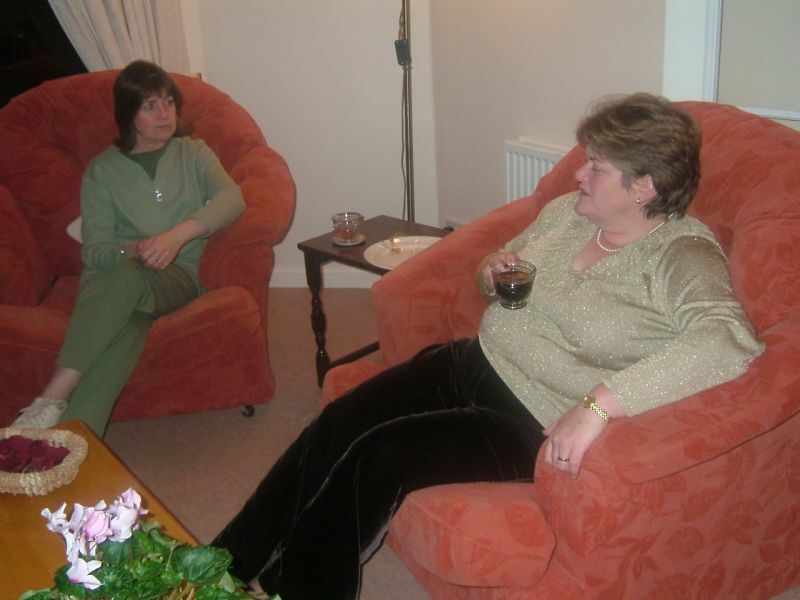 It really was a super evening." 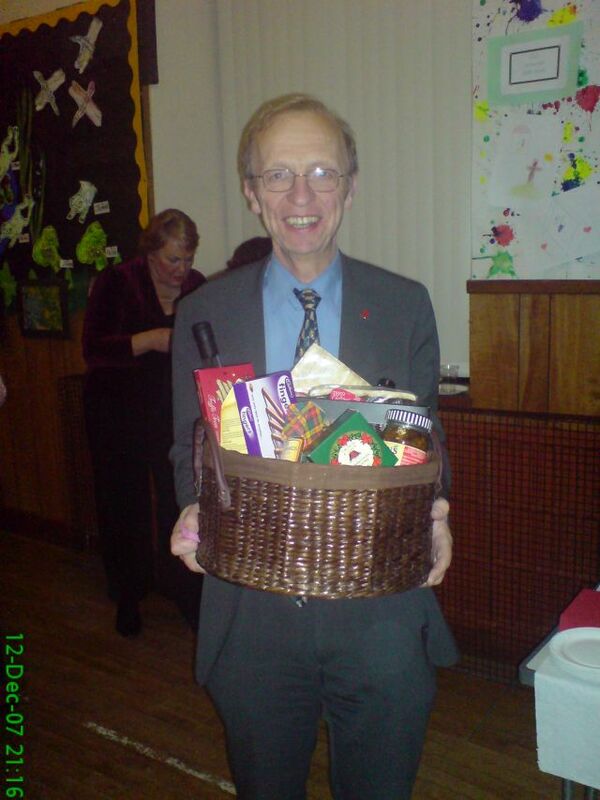 Thanks to John Smith for his usual high standard report on the evening. 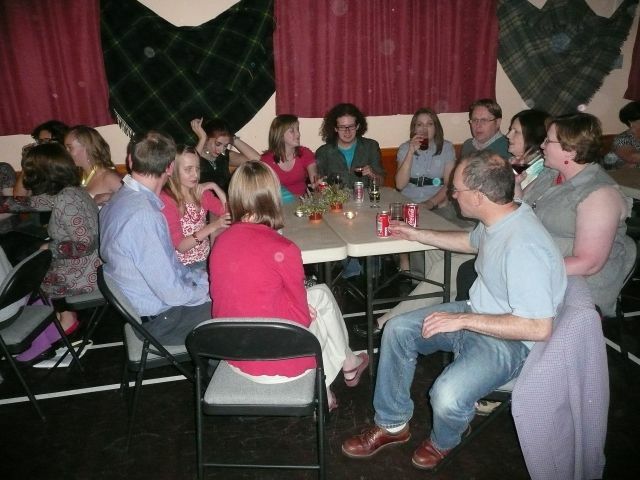 Thanks to Rob for sending in a selection of photos taken at our "End of Season" do on Wednesday after a short rehearsal. I was very tempted to put some captions under the pictures but I will leave that up to you!!!! 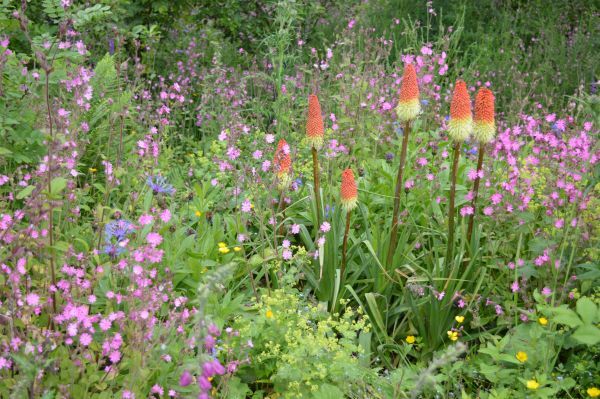 Just to finish up a picture of John's Garden and the two terr(e)ors, kept at bay for the day!!!!!!!!!!!! 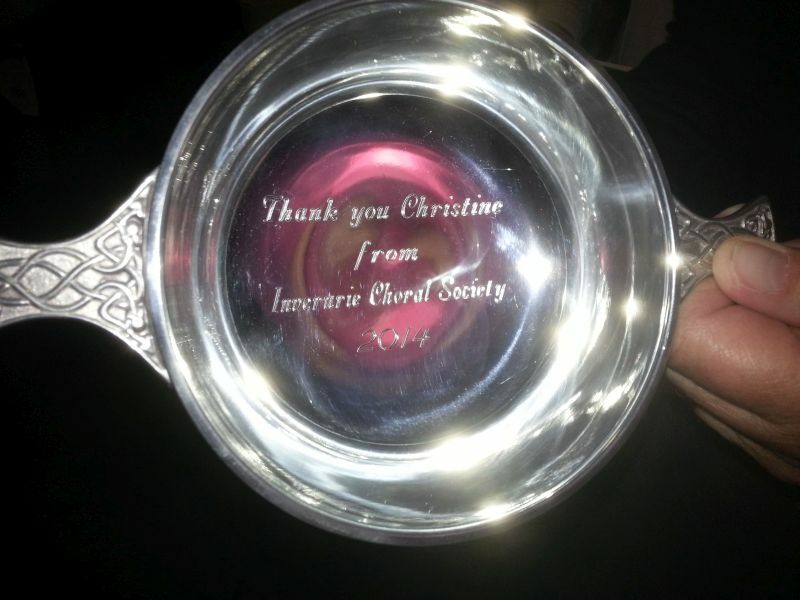 Last night, Wednesday 4 June, Jenny presented our wonderful accompanist Christine with a 5 inch quaich in polished pewter inscribed with the message: Thank you Christine from Inverurie Choral Society 2014. 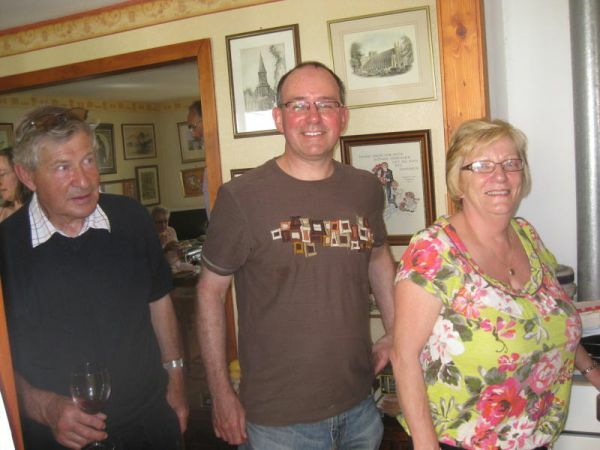 Christine and Peter are moving to Cambridge and we wish them all the very best for their future down south. 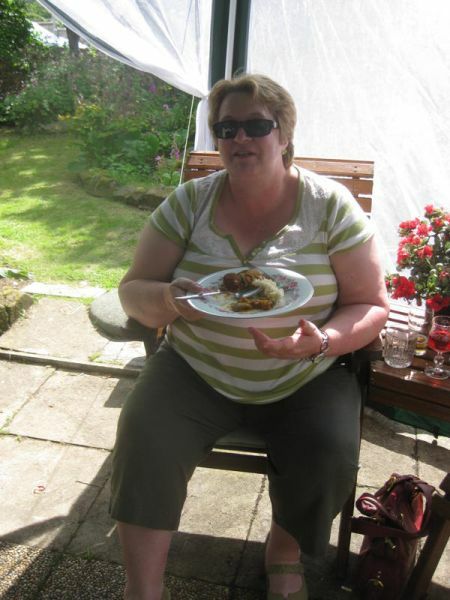 Christine, you'll be very much missed! After more years than Patty will admit to or others can even remember, Patty is giving up the position of Choir Librarian. 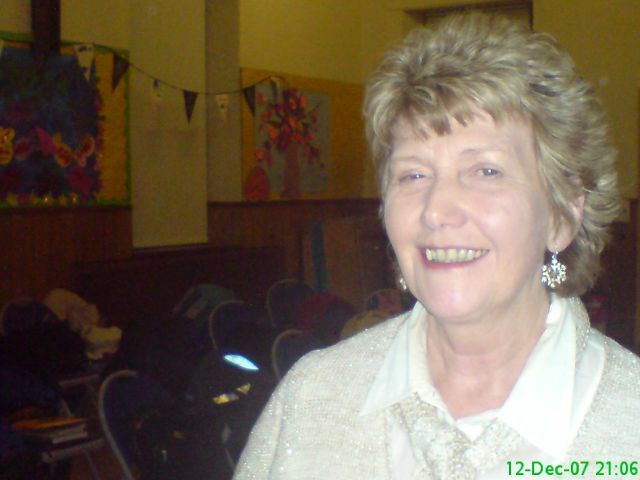 She has done a wonderful job of obtaining copy/hire and bullying people to return them on time. The hunt is now on to find a successor. 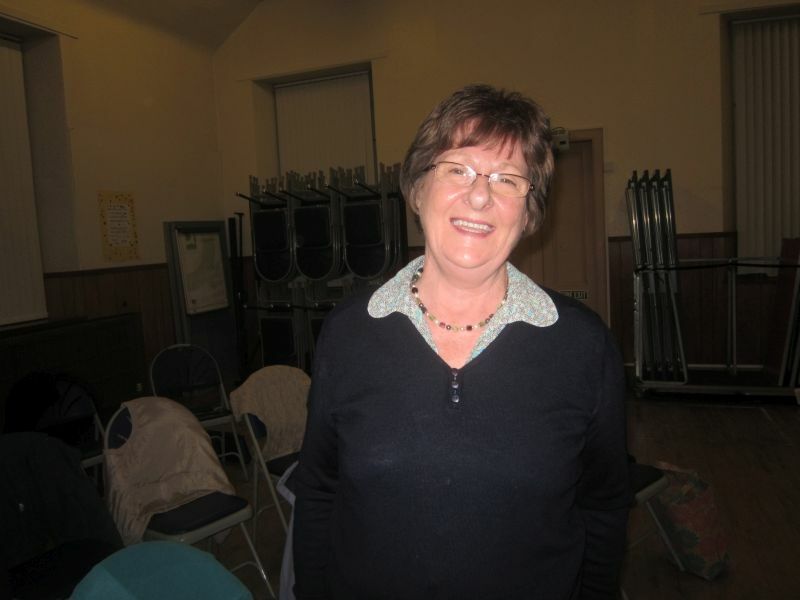 So, anyone who has a penchant for Librarian, contact any member of the Committee. Only qualifications needed are that you have a sense of humour and can read and write!! 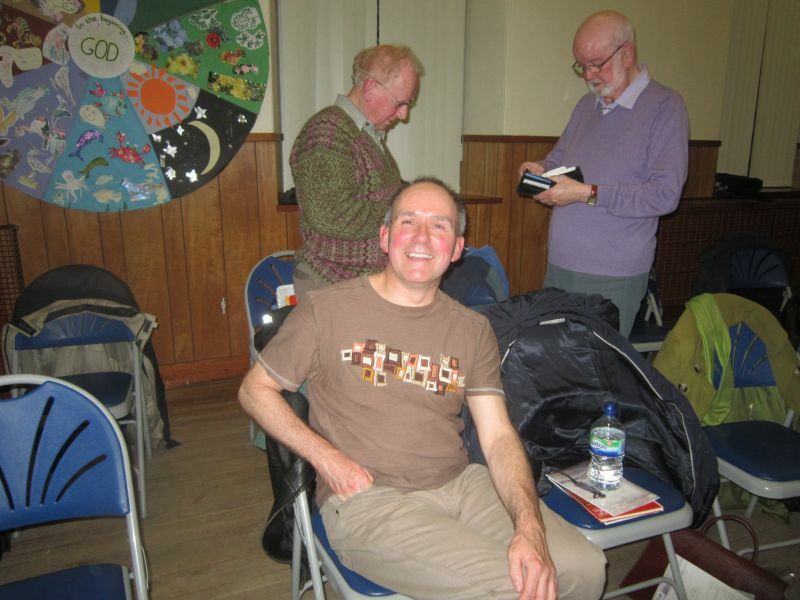 We had a real surprise when Richard Tanner appeared at the rehearsal last night and asked if he could re-join. 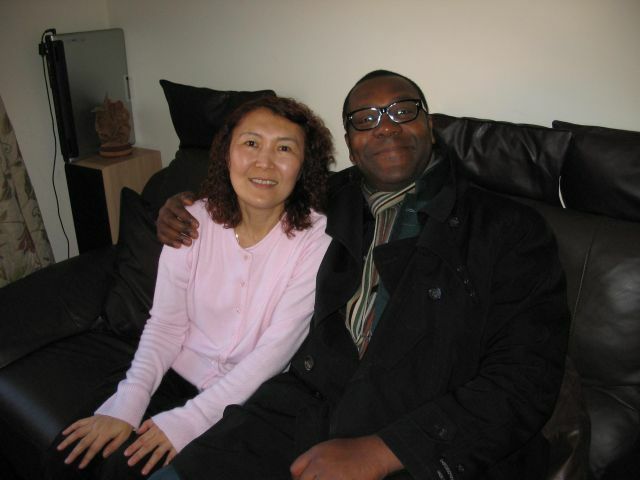 He had expected to move abroad but other things got in the way. You can imagine that the choir welcomed him with open arms and the tenors especially so. 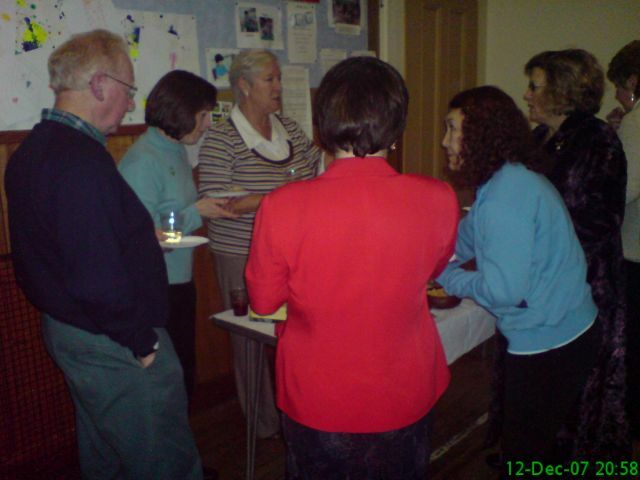 Finally a couple of photos of the Sales Table Maeve McDowall and Pam Morton do a power of work organising a monthly sales table. 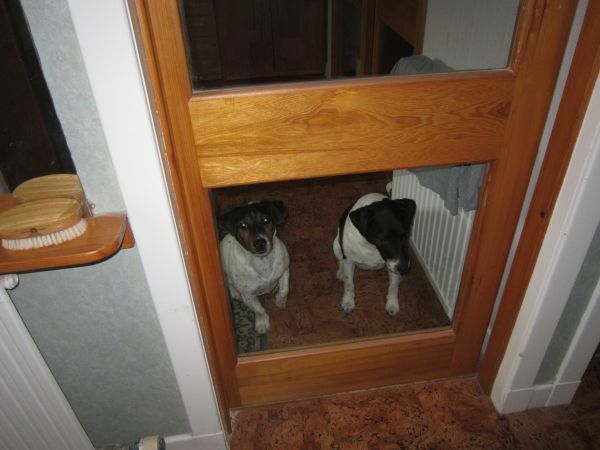 Last night they took in £56.25 (mustn't forget the 25 pence!) which was great. 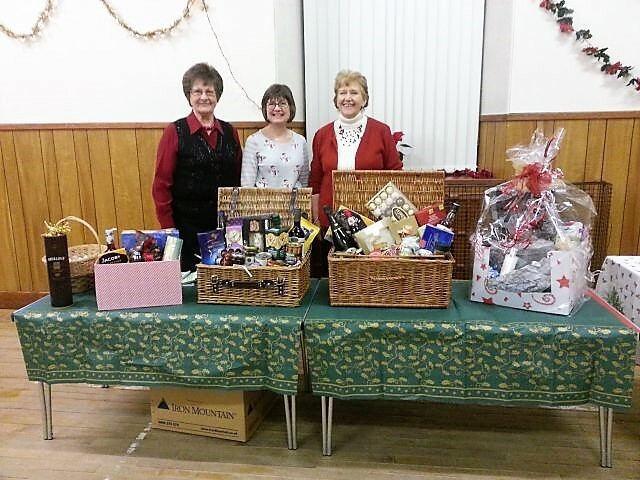 Over the past couple of years the Sales Table has raised several hundreds of pounds and has paid for the rehearsal hall at the West Church (which costs £30 per evening). Well done everyone. 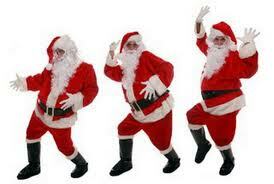 Its the "Alto's" turn this year. 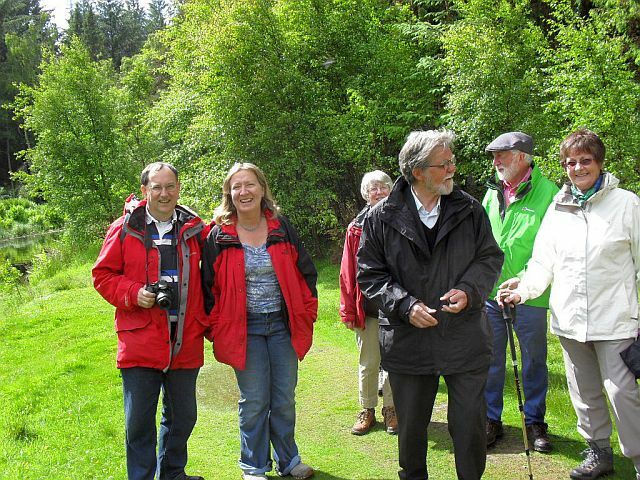 On Saturday 22nd June 2013, Patty and the "Alto's" arranged a walk around Castle Fraser followed by High Tea at the Bennachie Lodge Hotel in Kemnay. 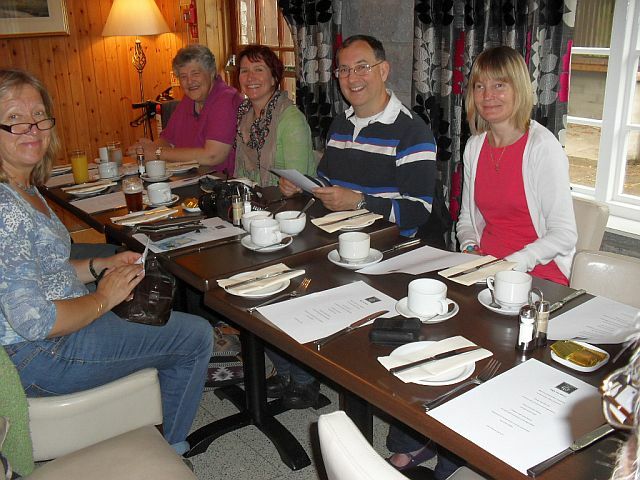 It was the altos turn to organise an end of season social event for everyone in Inverurie Choral Society and their partners. 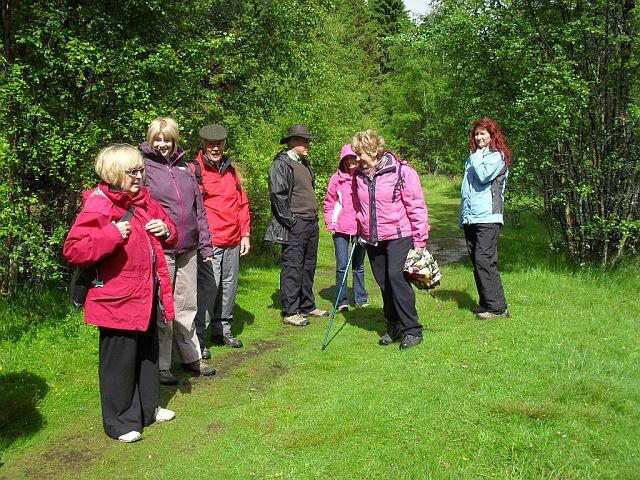 A walk in the grounds of Castle Fraser worked up an appetite as it winded its way through the beautiful woodland during an amazingly sunny interlude on Saturday afternoon, 22nd June. 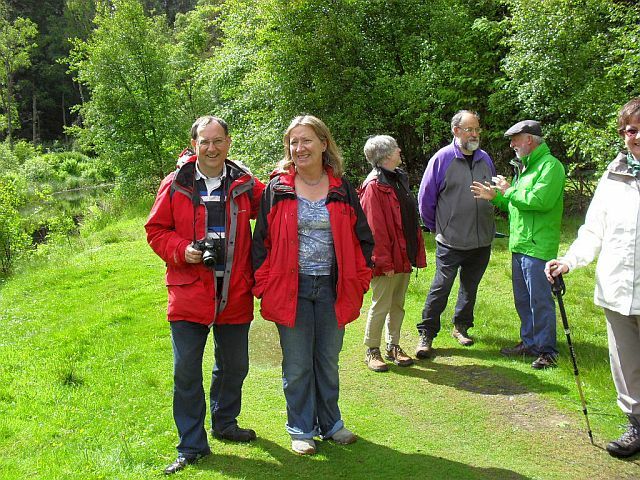 This was followed by High Tea in the convivial setting of the Benachie Lodge in Kemnay. 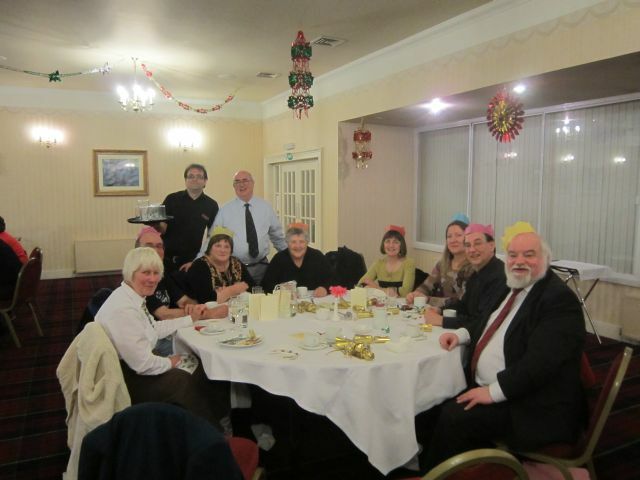 On this occasion the Choir did not have to sing for an excellent supper! Thanks to John Smith for sending the photos including the "arty" last picture. The 3rd of June dawned bright, although it did not end that way. 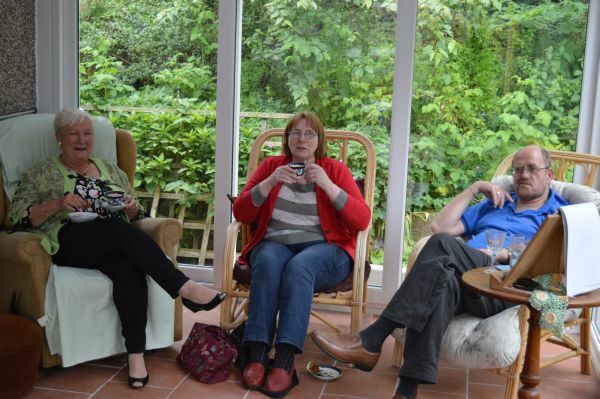 Undeterred, however, by the threat of bad weather members of the choir gathered at the home of Kathleen Mackay in East Fingask for an ‘end of year’ Garden Party, hosted by the soprano section. 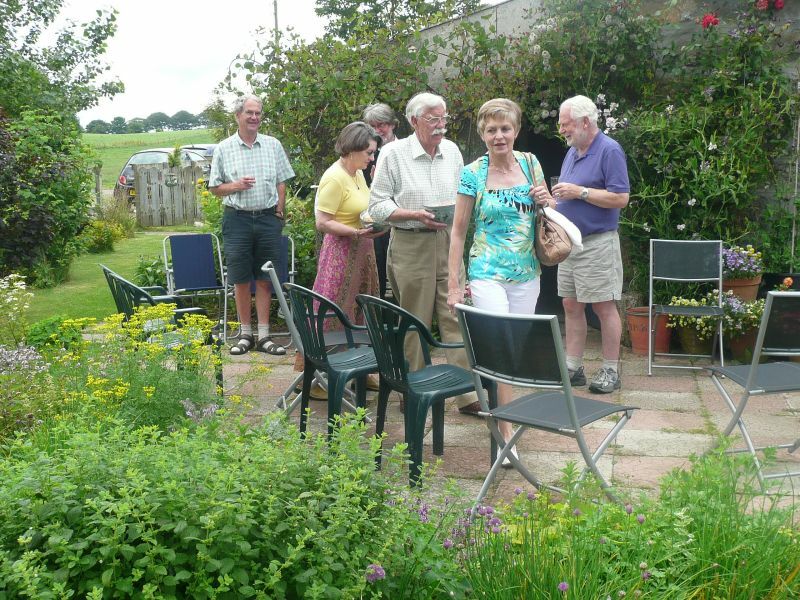 The success of our concert the previous weekend was fresh in our minds, and thanks for all her hard work goes to Moira who was not able to come to the Garden Party. 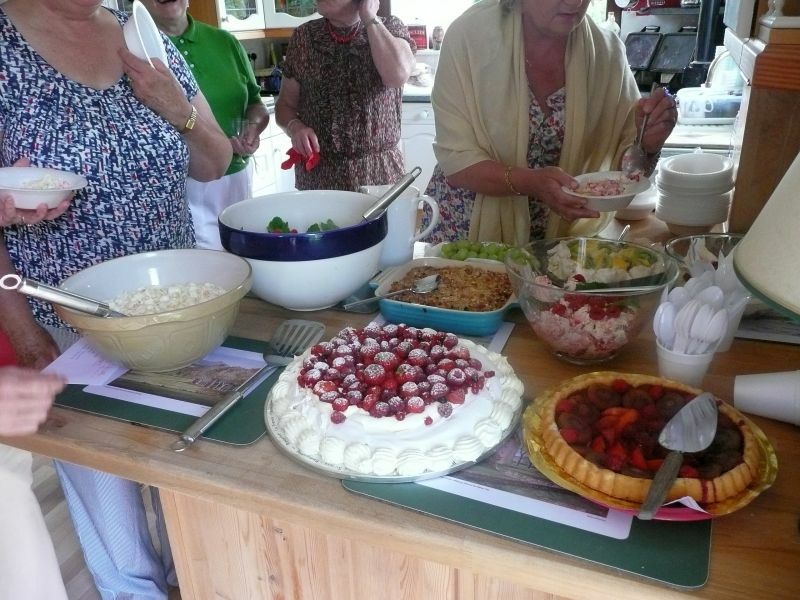 Mindful of the Queen’s Diamond Jubilee taking place over the weekend and beyond (obviously of slightly less importance than our concert), there was a definite red blue and white theme, along with traditional fare such as strawberries and cream, smoked salmon, and cucumber sandwiches. 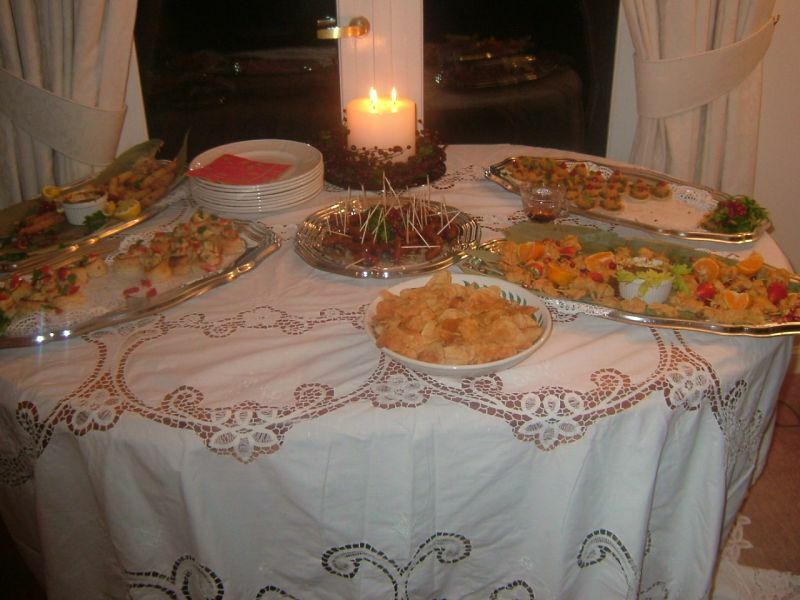 Fizz of various types was popped and everyone tucked into the delicious buffet. 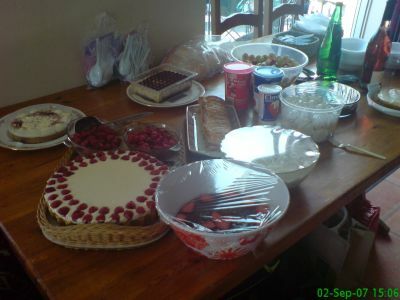 The gastronomical (fine) pieces de résistance were the desserts, or puddings, depending on One’s Social Position. 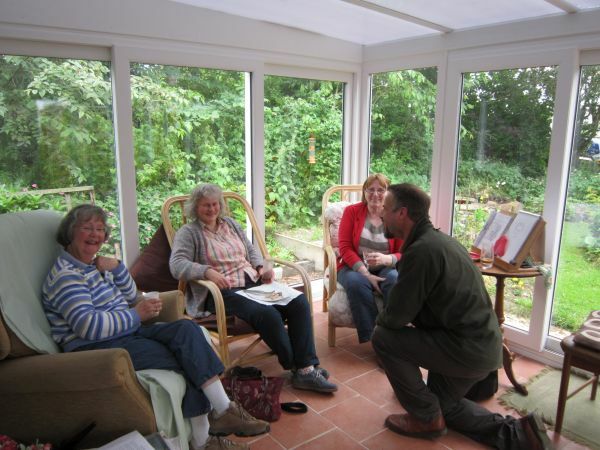 A number of people braved the breeze and ensuing drizzle to eat outside or took shelter in the summer house. 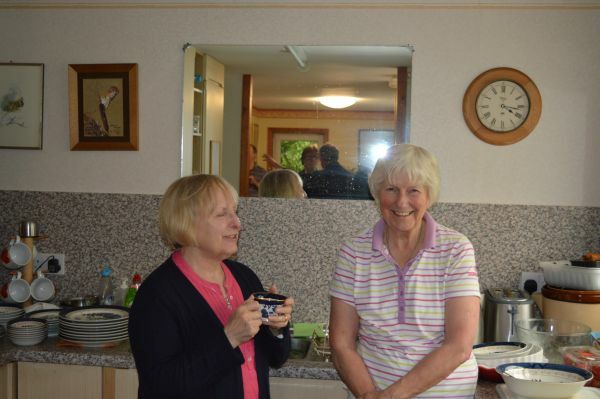 We reflected nostalgically on how hot we had been in the Acorn Centre the previous week- even needing a fan! (electrical rather than human). Hard to imagine as I write this. 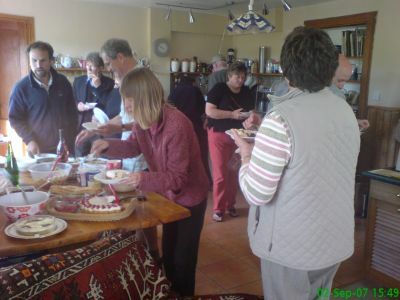 It did start to rain in earnest later in the afternoon, and the party decamped into the house to try to finish off the mountain of scones, cakes, fruit, meringues etc etc. Doggy bags were assembled so we could make absent family members fat as well. Happily we were not soaked as were the plucky singers on the Royal Barge. There are some advantages to not being professionals. Some discussion took place of who could remember the accession of the Queen to the throne in 1952. Our memories for such things may well be better than for words to songs. We speculated on whether we’ll all be together for the Platinum (?) 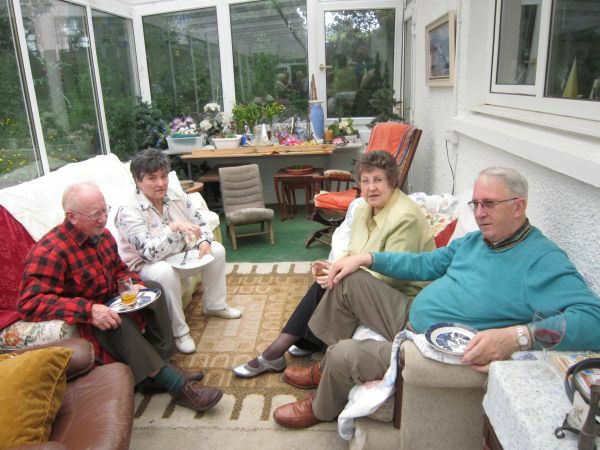 Jubilee in 10 years time – lets hope so, the intention is there, that’s for sure. 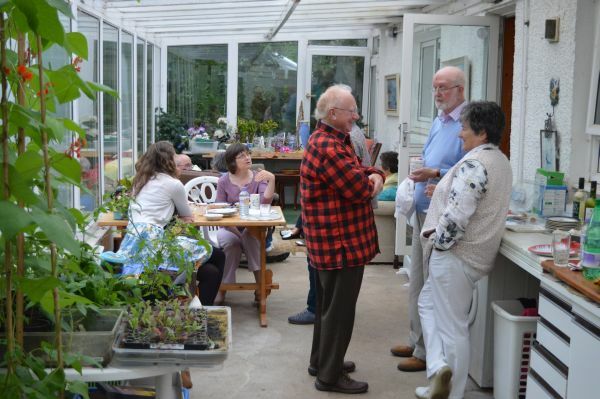 This was a perfect venue for such a celebration, and sincere thanks go to Kathleen, and to all the people who helped with catering and other necessities. 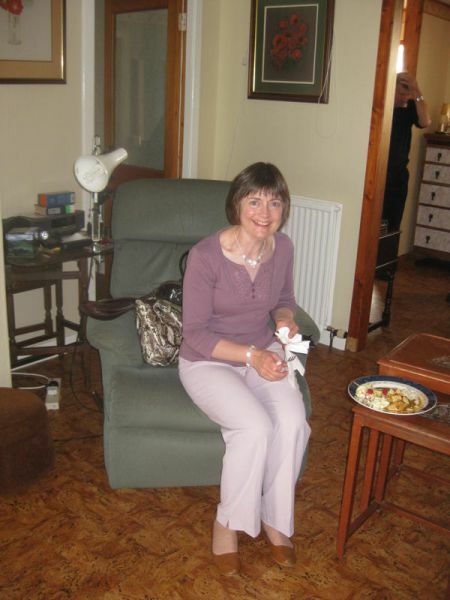 Kathleen has asked me to forward her thanks to everyone. 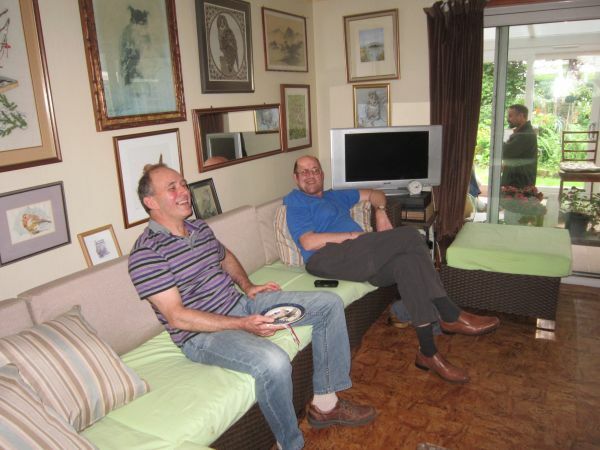 The sopranos are happy to be off the hook now and look forward to the nest occasion – hosted by the male sections??????? 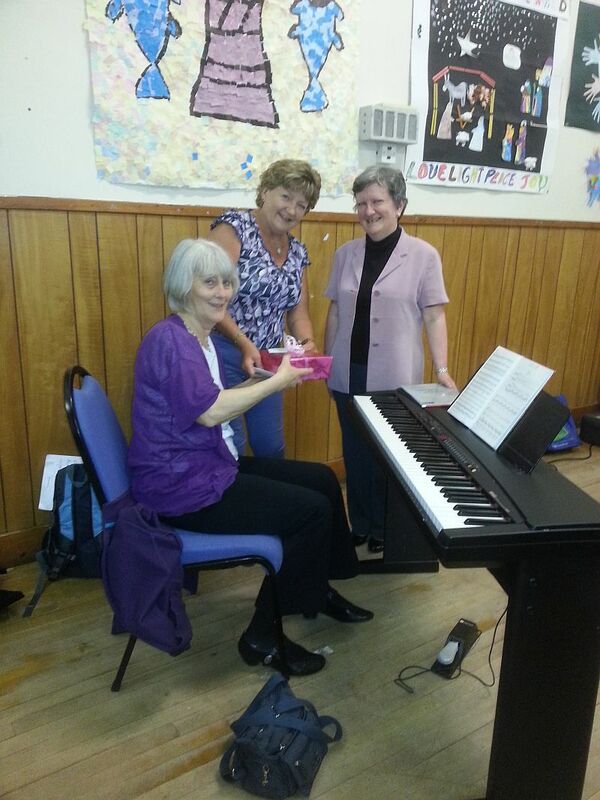 Choir begins again on August 22nd, in the West Church Hall. Look forward to seeing everyone there, have a lovely summer, whatever the weather. 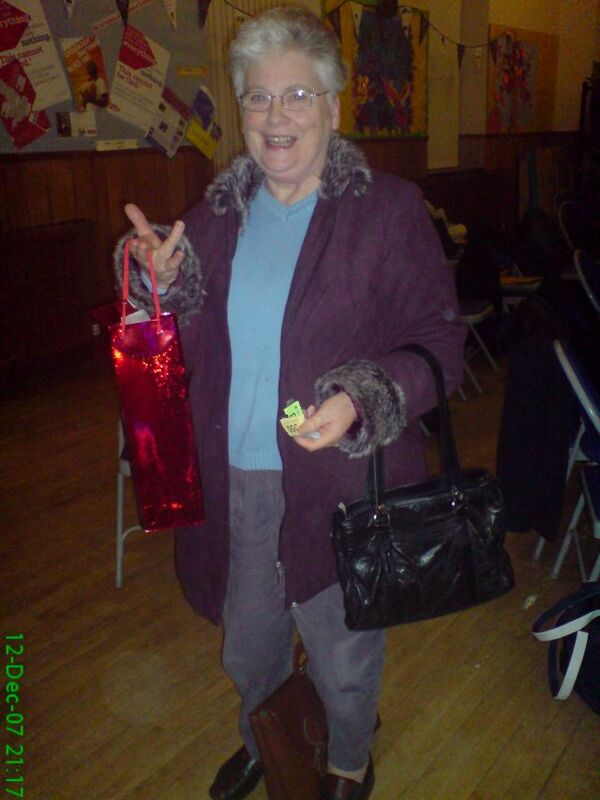 A little bird whispered in my ear that Iris recently celebrated her 70th birthday (How many times is that "21 Again"?) 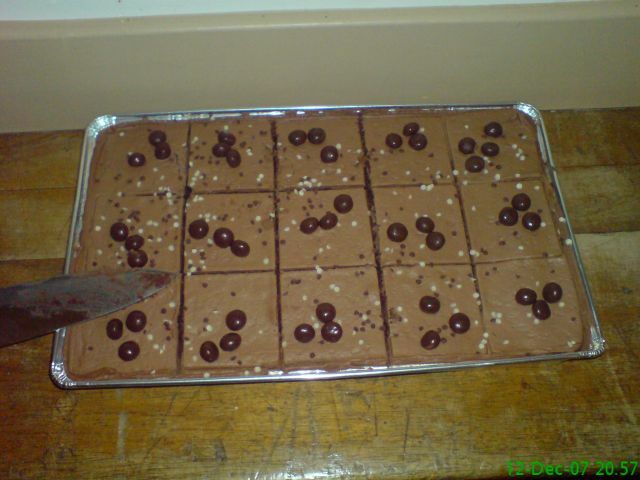 Christine Ross baked a cake for the event. It was presented by Christine and a verse of Happy Birthday was sounded. Iris was quite surprised. 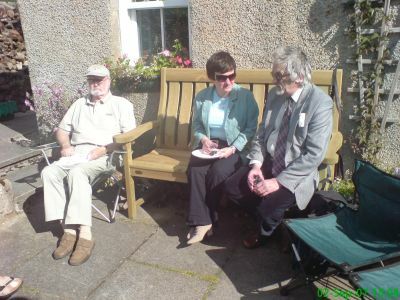 The annual Summer Party was held at John & Elizabeth Smith's house in Turriff. From what I heard, the weather was fantastic (does that mean it stopped raining for half an hour???) 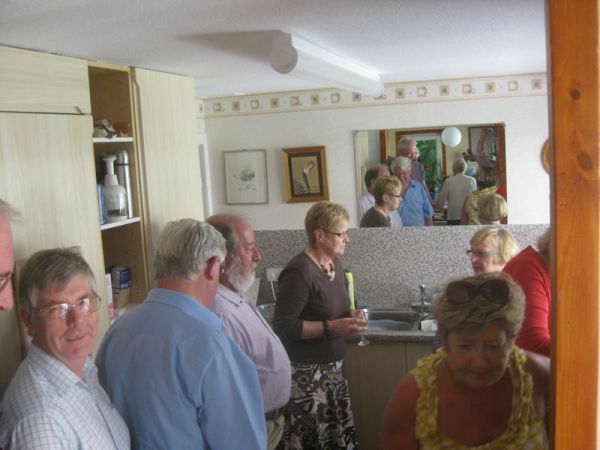 and about 30 people turned up. 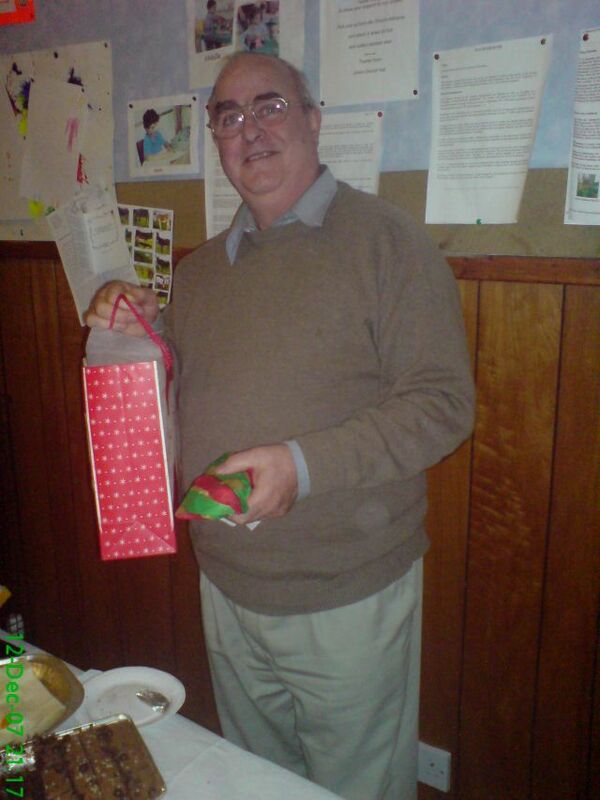 John tells me that you were all very generous in providing food and drink so the money that was raised will be put towards a choral event which will be decided by the Committee. 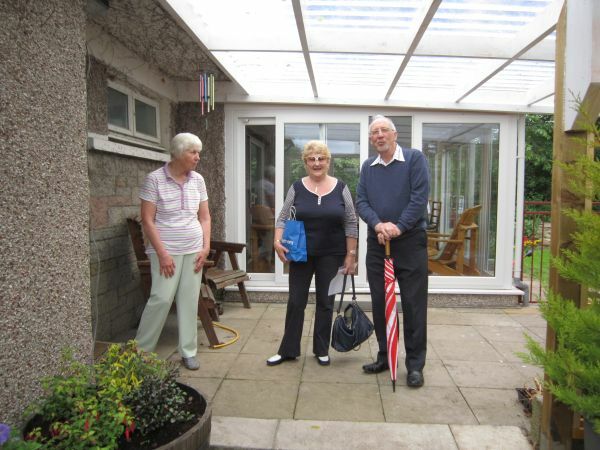 Thank you John and Elizabeth for your generosity. Sandy & I wished we could have joined you. 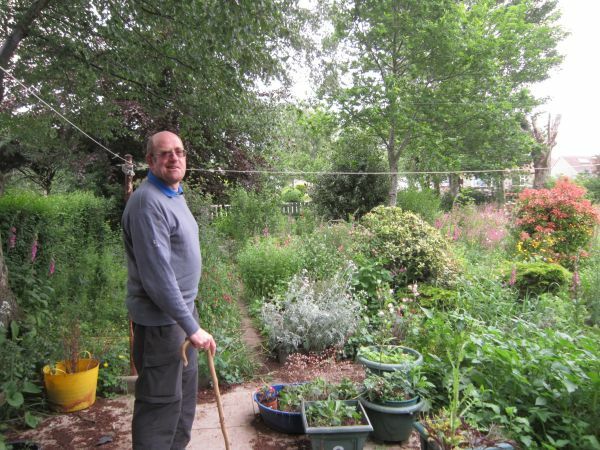 John very kindly sent me some photo's so here they are. Not sure what Pagan traditions exist up in "Turriff Land" but a certain resident of Turra thought it would be appropriate to celebrate the unveiling of the "Turra Coo". I can't find anything in Wikipedia but "sources" tell me that the original Turra Coo hit the headlines in 1911 after farmer Robert Paterson of Lendrum, Turriff refused to stamp employees insurance cards. Sheriffs Officers seized one of his cows but a near-riot broke out at Turriff Square when an attempt was made to sell it. 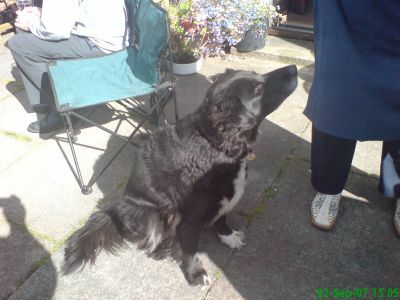 The animal was later sold in Aberdeen and bought by farmers who returned it to Mr Paterson. The Sculpture, in bronze, was said to have cost £84,000. The original Turra Coo hit the headlines in 1911 after farmer Robert Paterson, of Lendrum, Turriff, refused to stamp employees’ insurance cards. 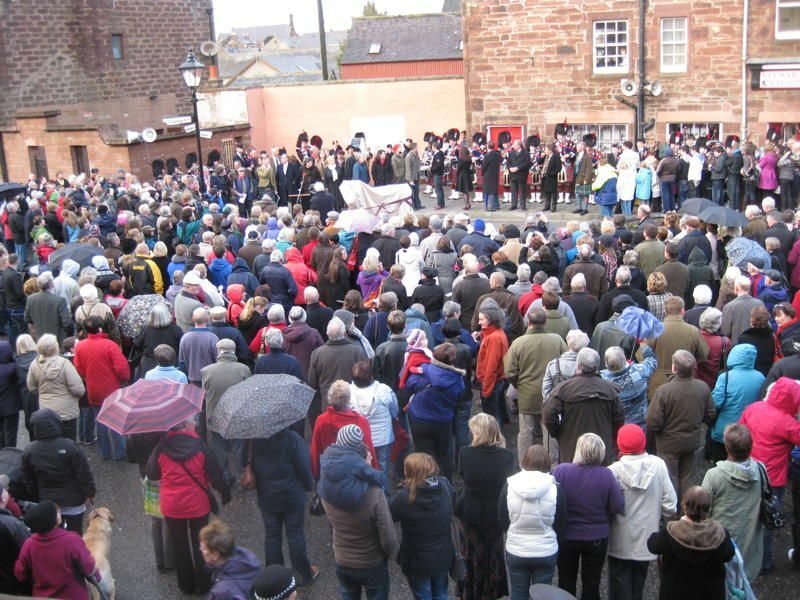 Sheriff’s officers seized one of his cows but a near-riot broke out at Turriff Square when an attempt was made to sell it. 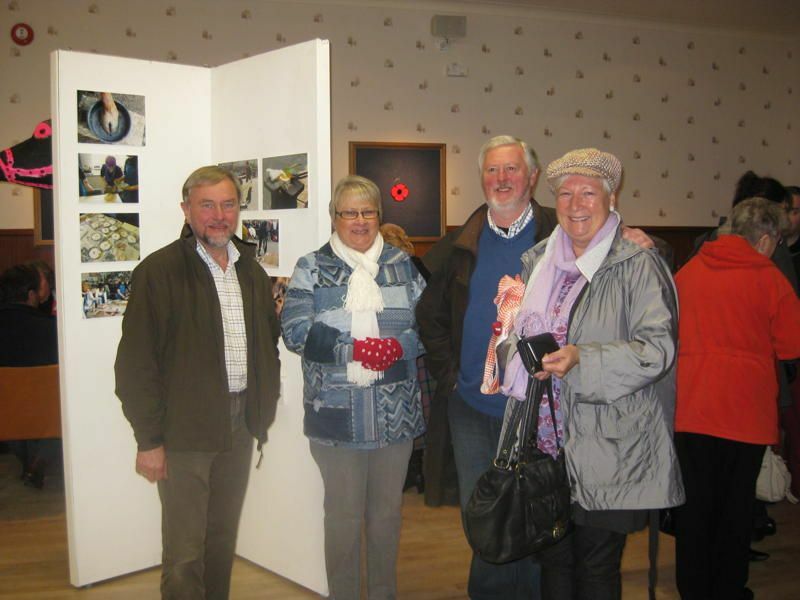 It seemed to be a great success - the social night at St. Mary's newly renovated Church Hall. Lovely venue for us and just the right size - not too big. 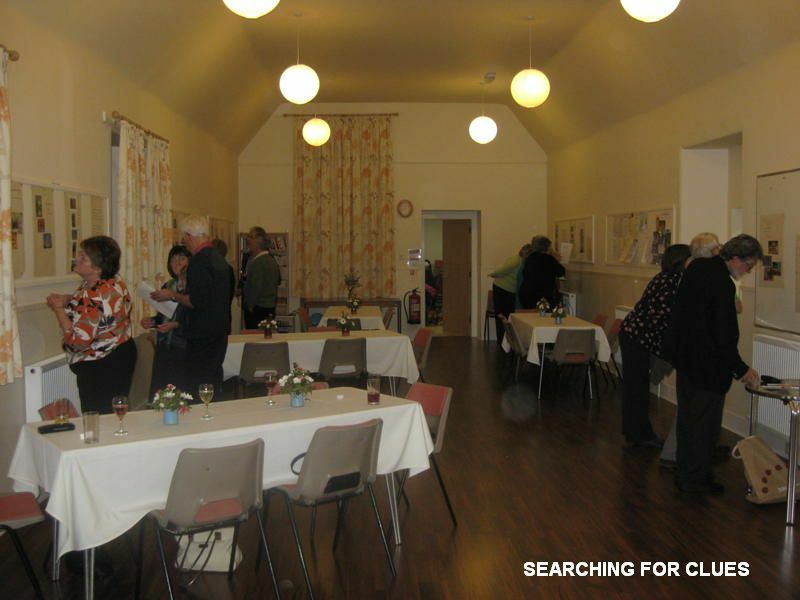 They seem to have thought of just about everything when extending and renovating the old Church Hall which used to be a school at one time I hear. Nice new big kitchen with dishwasher and all mod cons and rules and regs - I had to be designated Kitchen person - such a responsibility!!!! 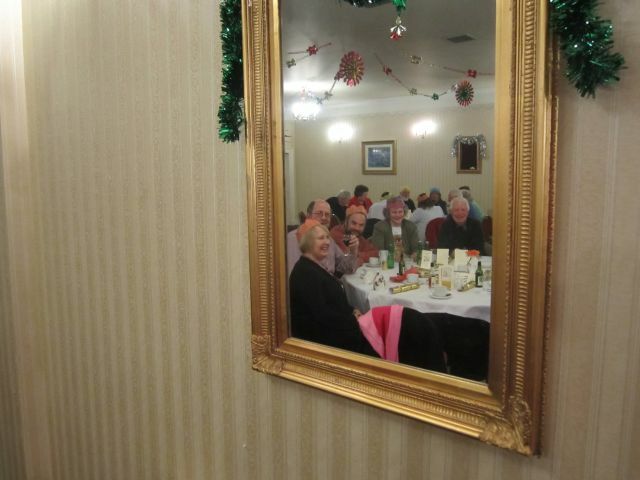 Thank goodness it was a cold buffet. 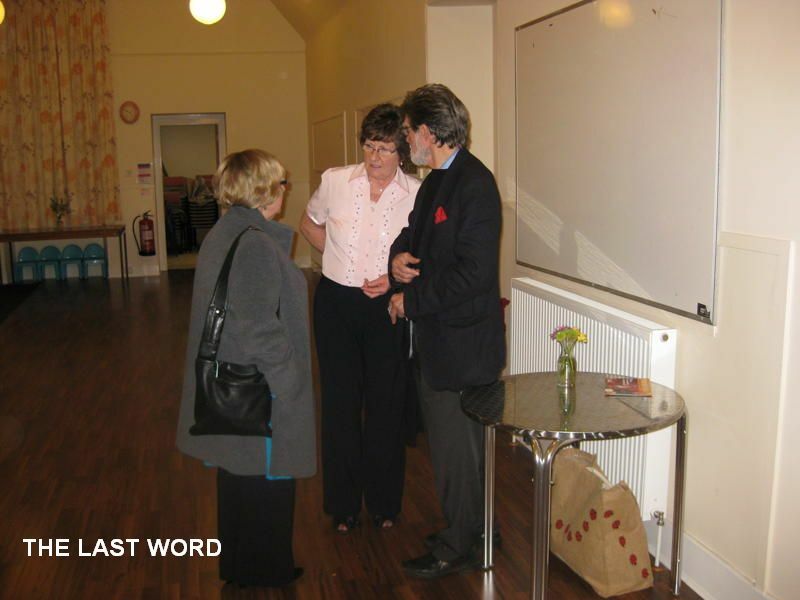 All round the walls were notice boards so that it was easy to pin up the visual clues without causing any damage. 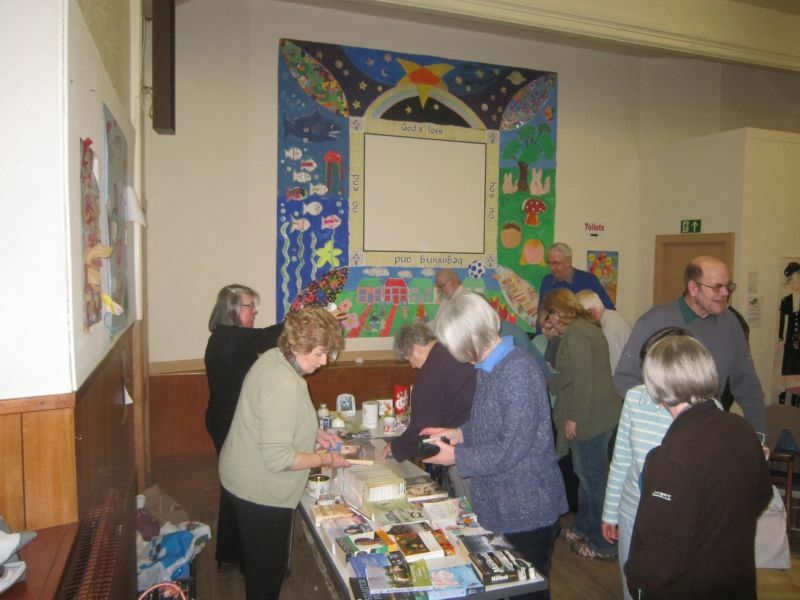 This was vital as the quiz consisted mainly of postcards pinned up in groups around the room and folk had to guess where, what, who and when. I got everyone in teams of 3 randomly by giving them all a little ticket with team names like Jack, Queen, King. This alone got people mingling and talking looking for their other two team members and not knowing if 'Queen' for example meant Royalty, Rock Group or what. We managed 6 teams. They also had to find some hidden objects identified by rhyming clues. 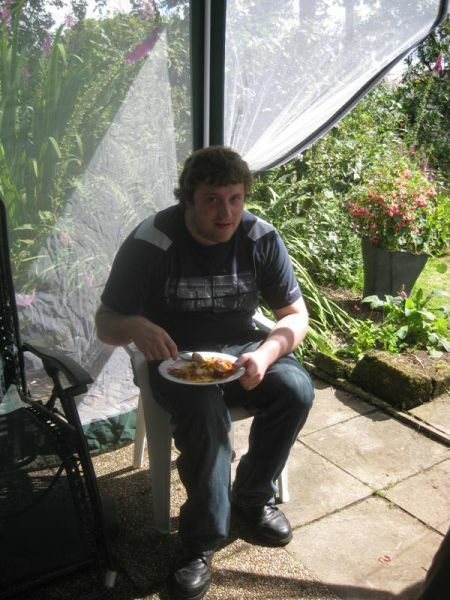 The food brought was super. 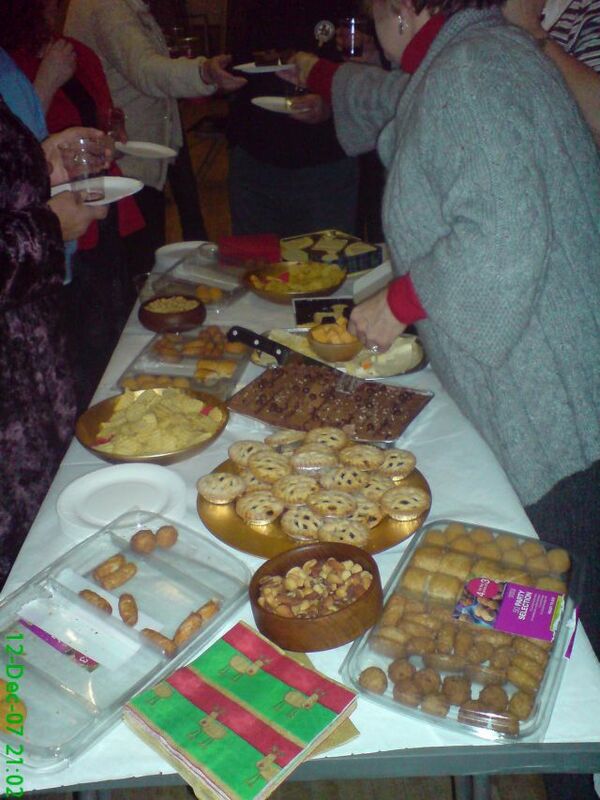 Just the right mix of nibbles to start and then savoury and desserts so everyone bringing a 'plate' did really well. 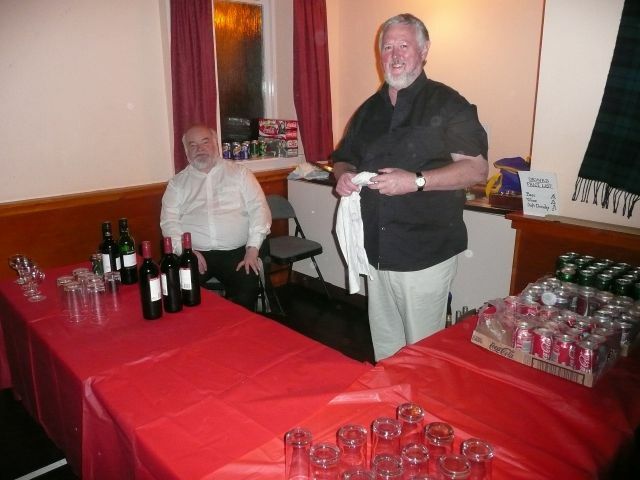 Plenty of wine and soft drinks too. 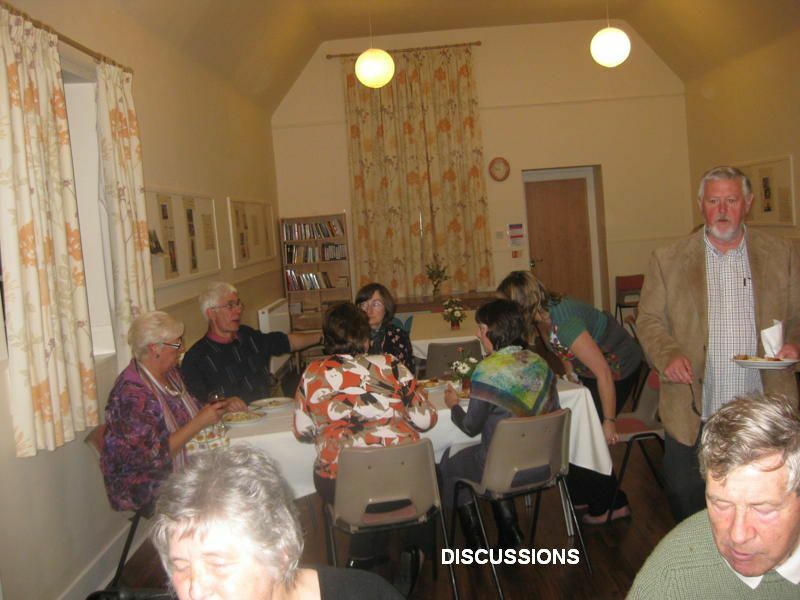 It was a pity I had only booked the hall until 10.00 as I think everyone was quite ready to stay on for a bit longer for a good old natter. 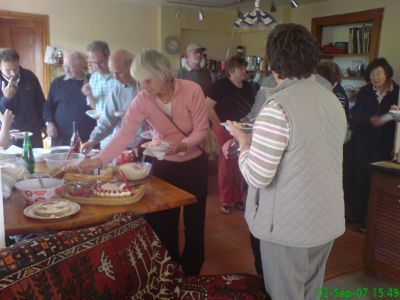 But it was £20 an hour so had asked everyone to pay £3.00 and bring their own food! 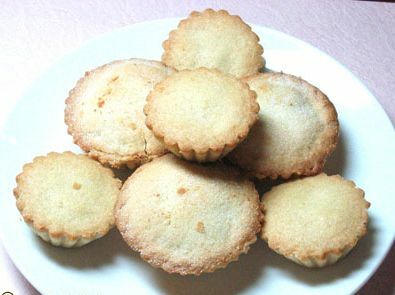 I am sure if we did it again we would take it for a bit longer and maybe more would manage - We had 22 in all though. 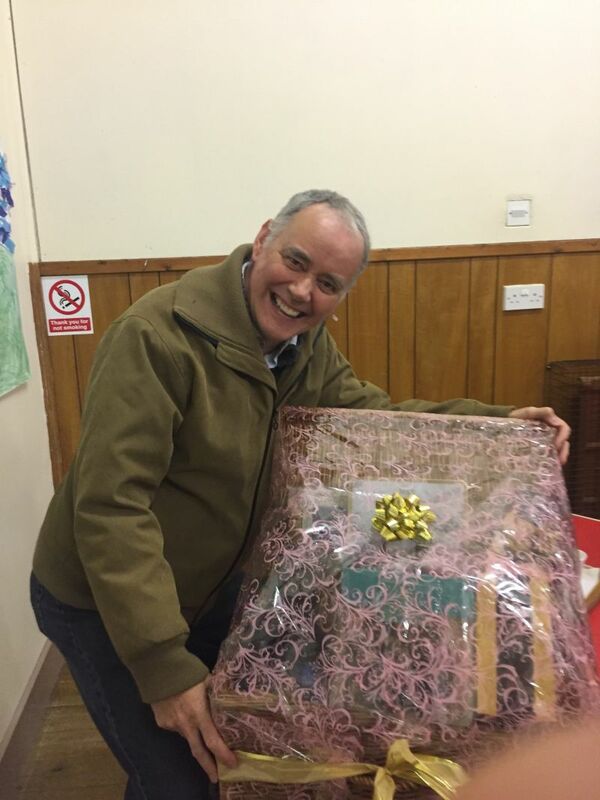 My husband, Derek, helped with marking the quiz and reading out the answers and Mhorag Atkinson helped with a Music round for the Quiz and helped in the kitchen too along with Noel who also provided the prizes for the team of 3 who were first. Mobile phone holders when being charged - quite novel. So a good night was had by all I think. 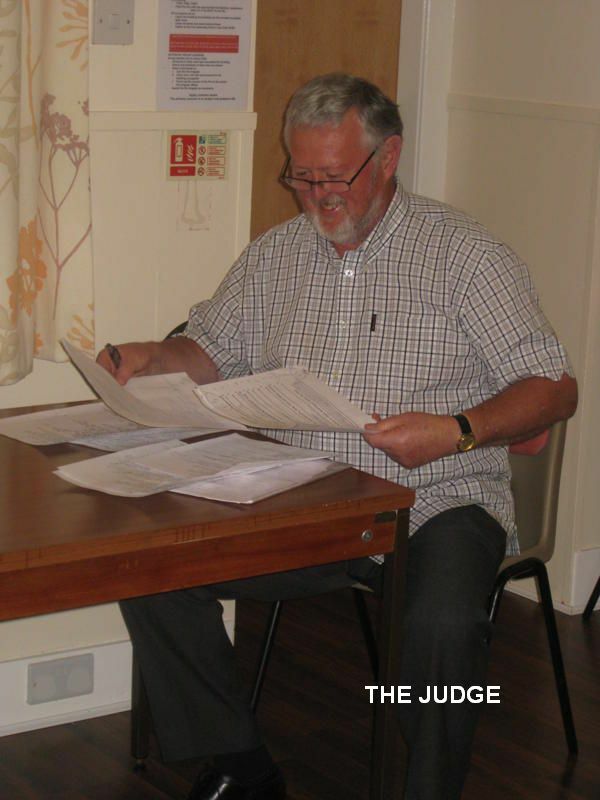 Thanks to Anne Robertson for the report and to John Smith for the pictures (The captions are his!!!). There were only 11 folk in the end but we had three alleys 4, 4 and 3. I was one of four women and most hadn't a clue about bowling so it was fun finding out about scoring, how to hold the ball and what symbols meant e.g. that an 'f' meant 'fault' so we learned that one of us kept stepping on the line thus managing the grand total of 28 points in the end. 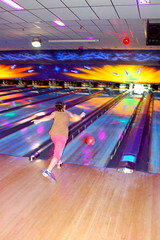 Another lady, who was our best player in fact, had a unique technique which meant that the ball landed halfway down the alley before beginning to roll...... I myself tried a larger and weightier ball than usual in a vain attempt to gain high scores only to find it slipped out of my fingers backwards. NO PHOTOS though, I am glad to say. But of the joy when one nearly got a 'strike' and at least got a 'spare' - You see we became quite the experts by the end of the game. Anyway, pity we only had one game as we were only getting into our stride when it all ended, honestly!!! 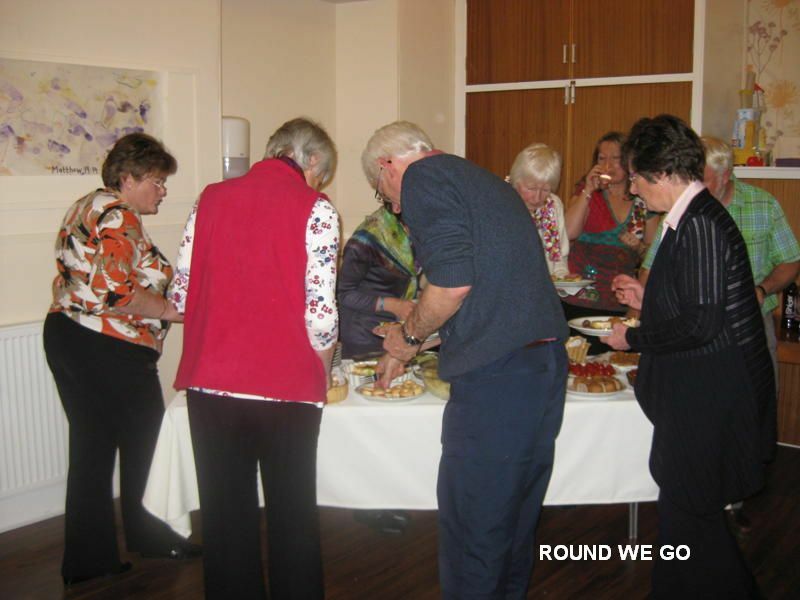 We had a plentiful finger buffet afterwards too and a bit of a blether. So a good time was had by all. 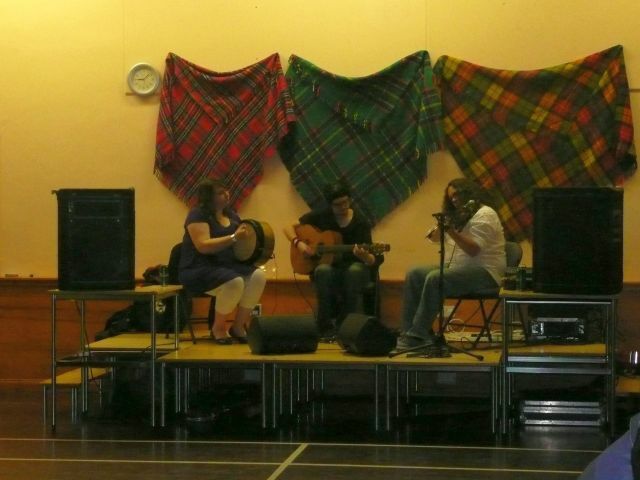 We held our annual Ceilidh, once again, at Daviot Village hall. 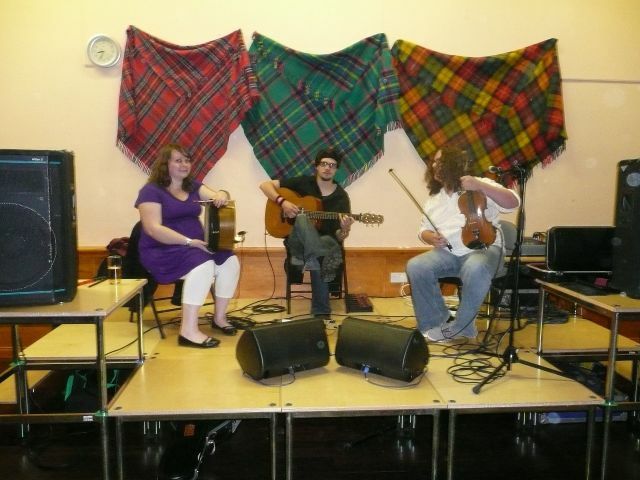 Ably led by Ceilidh Band "Heuch", everyone entered the spirit of the Ceilidh. 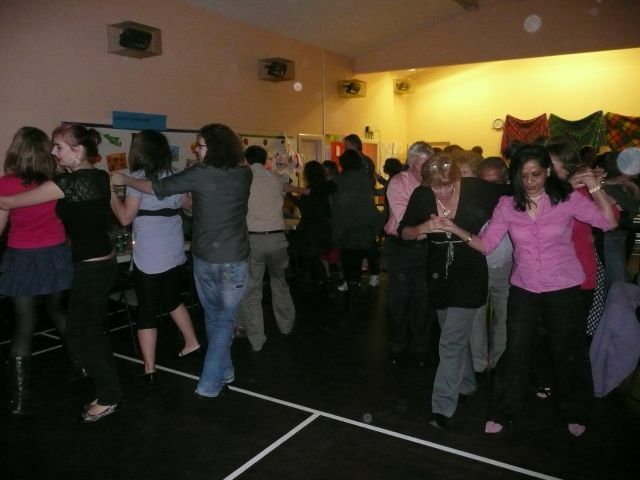 A lot of effort was put into this Ceilidh and thanks must go to the Organising Committee, the "Bearded Barmen", the "Dinner Ladies" and everyone who donated prizes for the Raffle. I am not sure how much was raised but no doubt someone will let me know, seeing how you ALL keep up to date with our website. 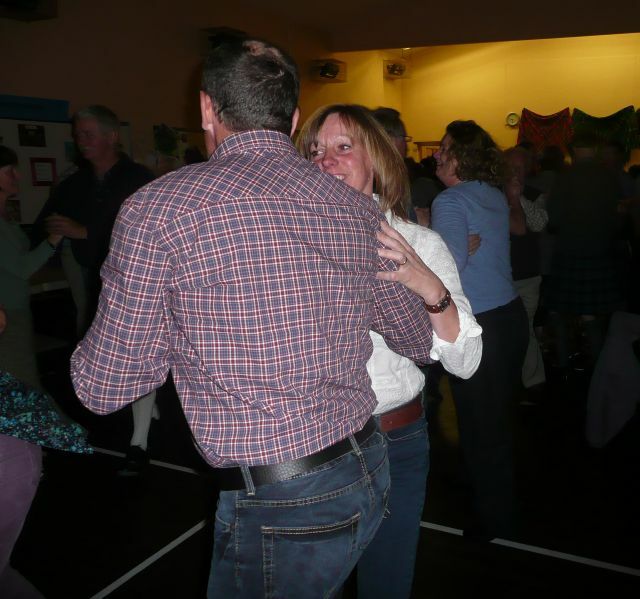 I have attached a few photos from the Ceilidh for your perusal. 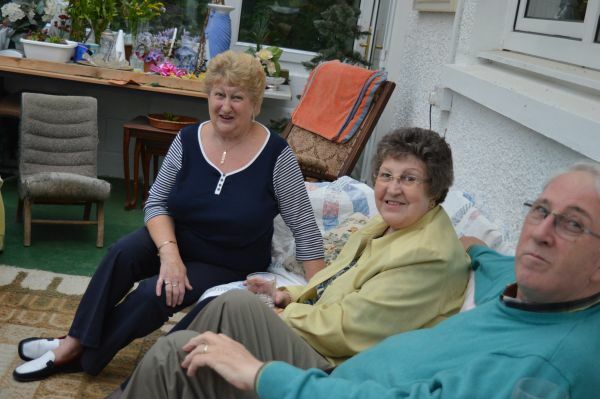 This year's Summer BBQ was held at Christine and Andrew Ross's. 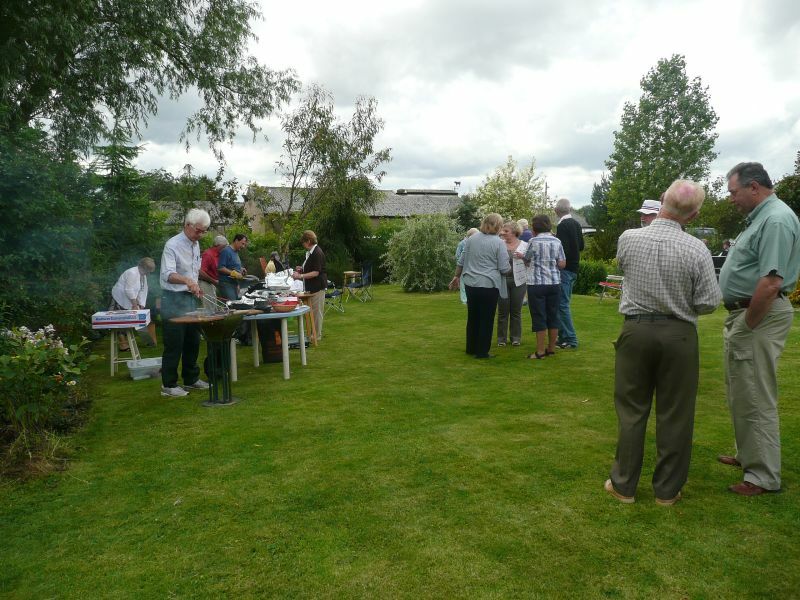 Whilst the weather could have been fairer (at least it didn't rain), the BBQ was well attended. 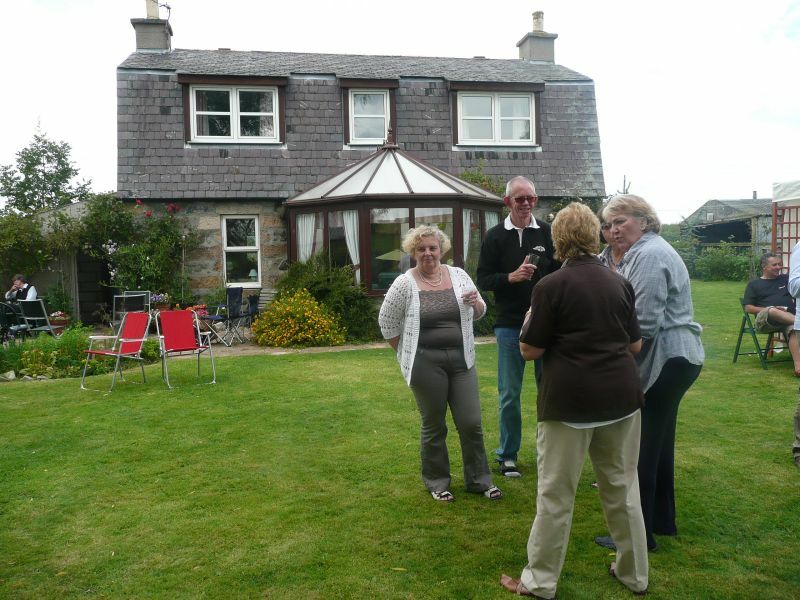 Hillhead House is in a lovely location which set off the BBQ. 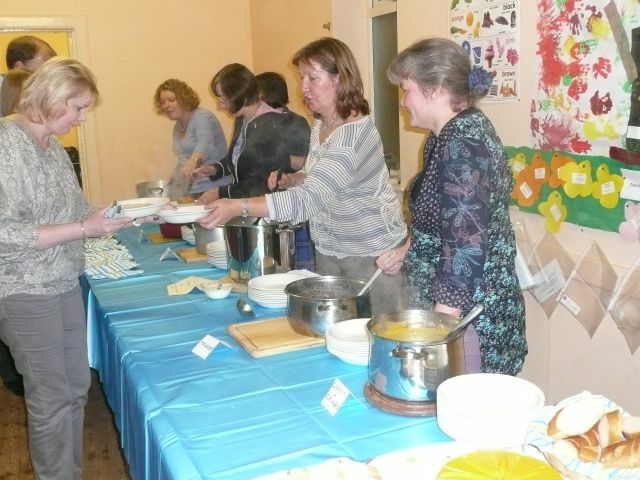 I have to say thanks to the sterling efforts of our volunteer Chef's. 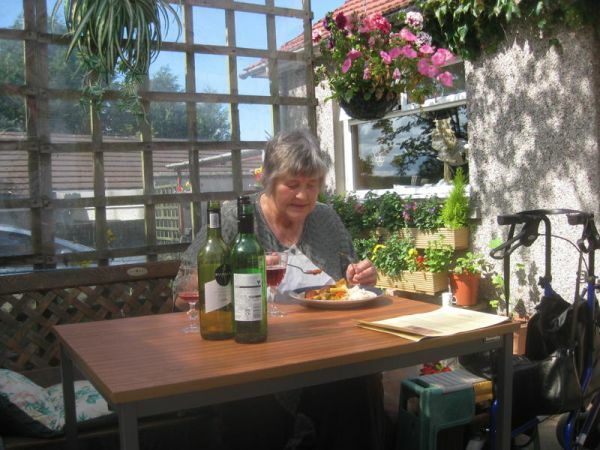 The food was excellent, tasty and well presented. Armed with my camera, I tried to take a flavour of the afternoon. It seemed strange to me to be on the other side of the camera for a shot as I normally hide behind it when I am taking the photo's. 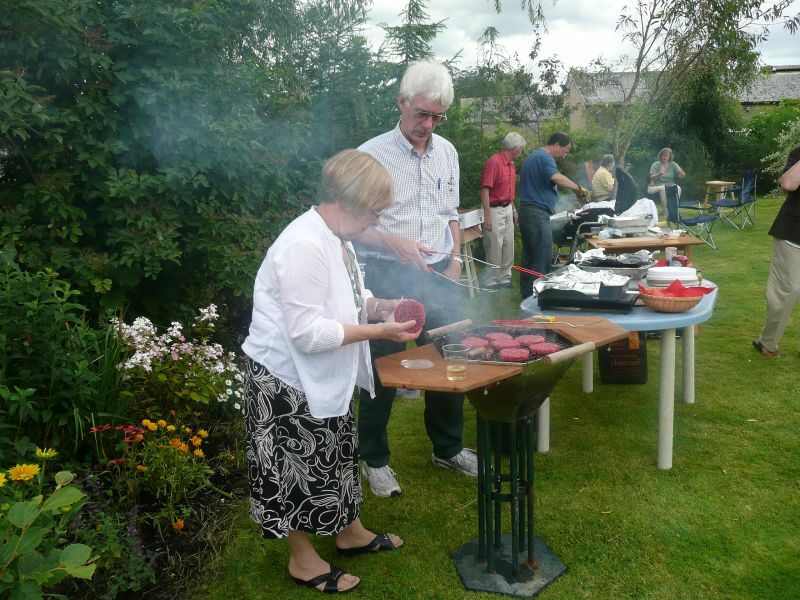 Again thanks to Christine and Andrew for providing the location and for the Committee in arranging the BBQ. 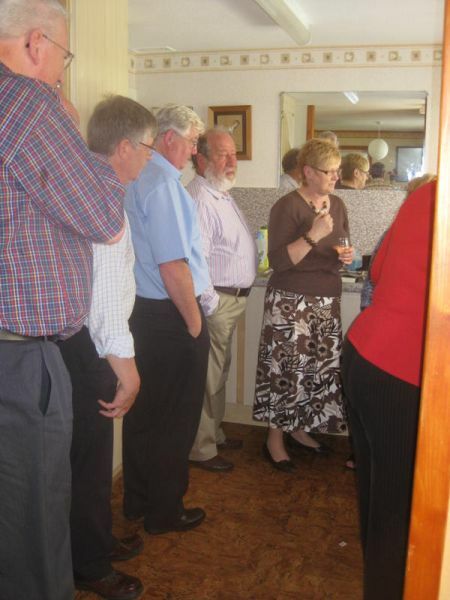 It is always appreciated the efforts that go into producing such Social events. 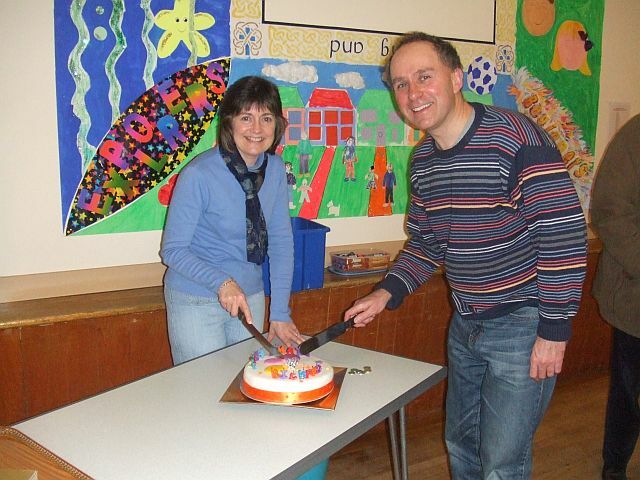 A surprise celebration took place at a break during rehearsal on Wednesday. 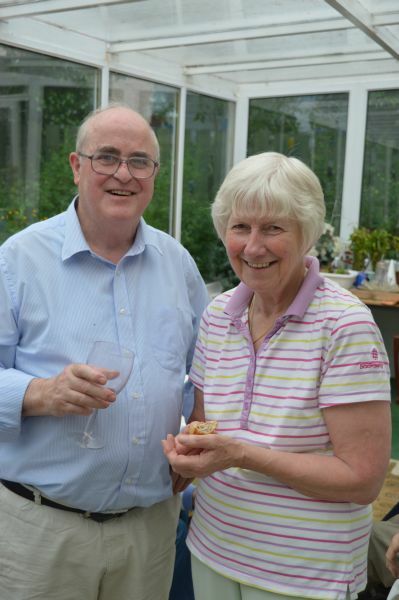 Founder member Dianne Wernham (alto) and brand new member Richard Tanner (tenor) found that they had 50th birthdays in common to celebrate. 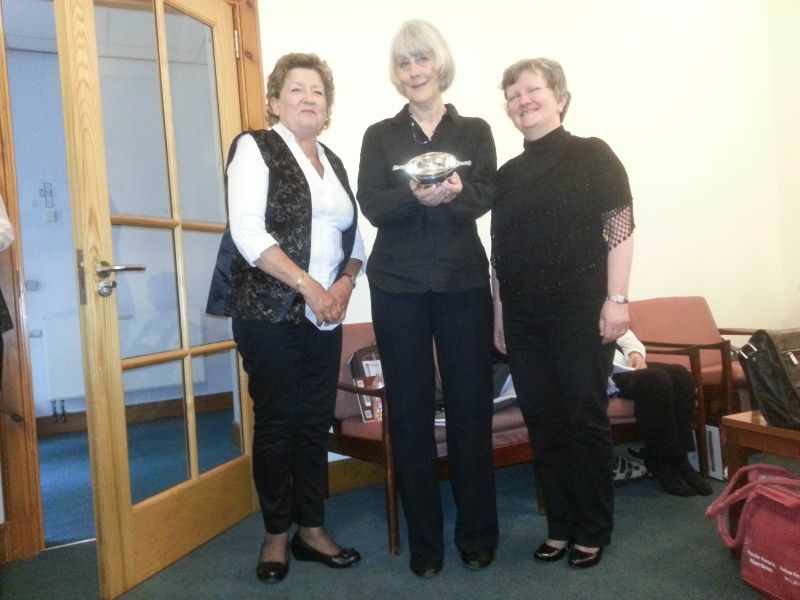 They shared the event with the rest of the choral society. 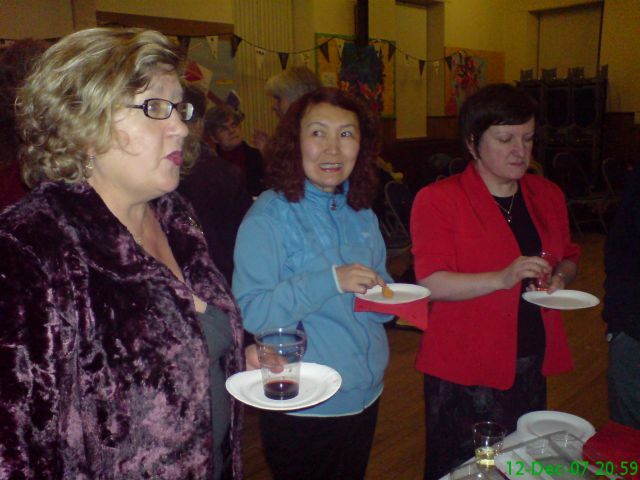 There was another celebration that evening. It was Pam's birthday. 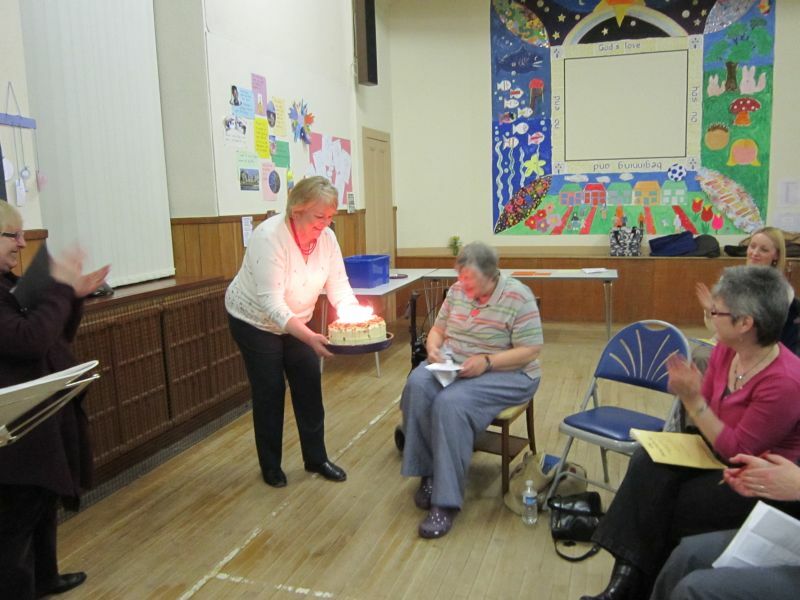 She didn't say how old she was but Inverurie Fire Brigade was on hand to put out the candles!!! 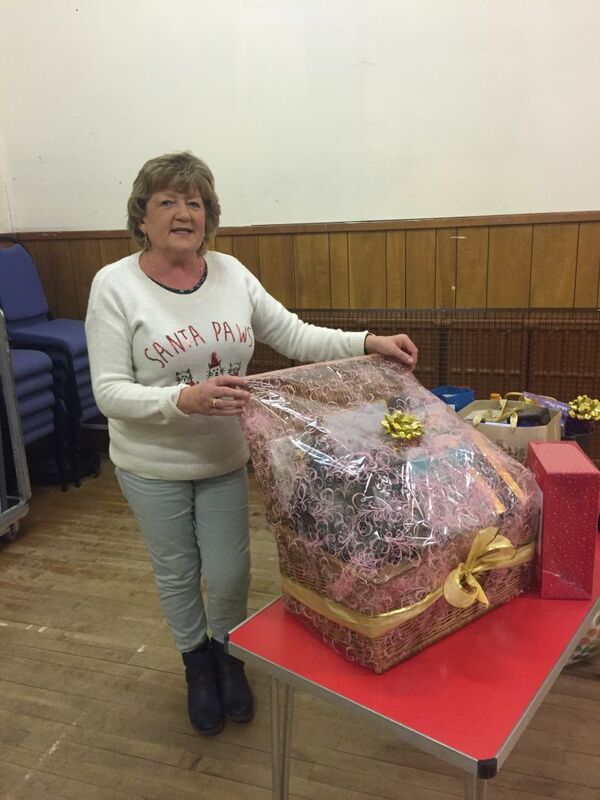 Patti very kindly organised the Christmas Raffle. 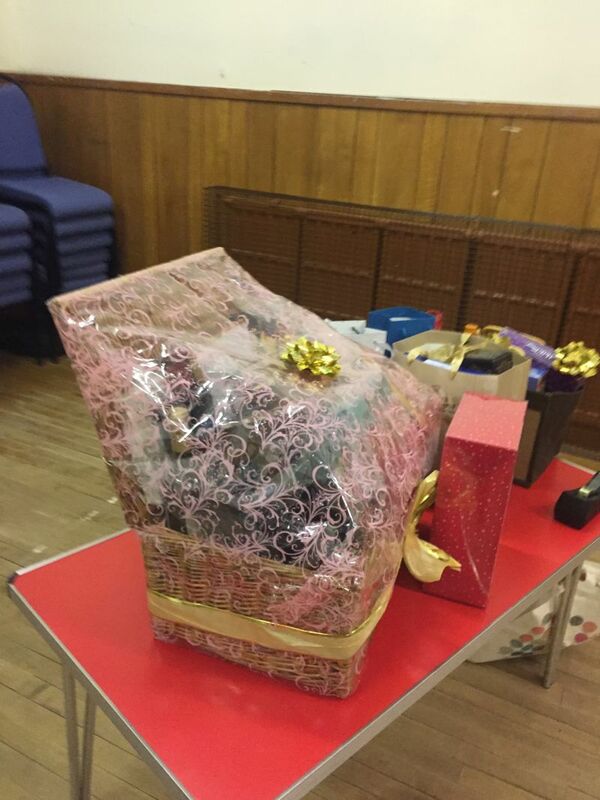 There were so many donations that she decided that there would be three prizes. 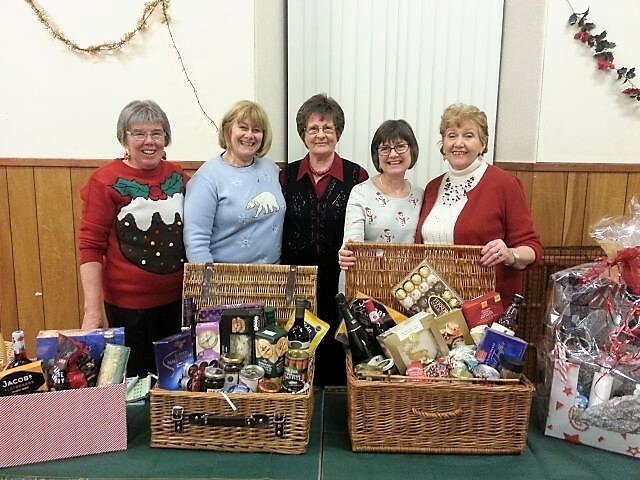 The raffle raised £90 for the Society. 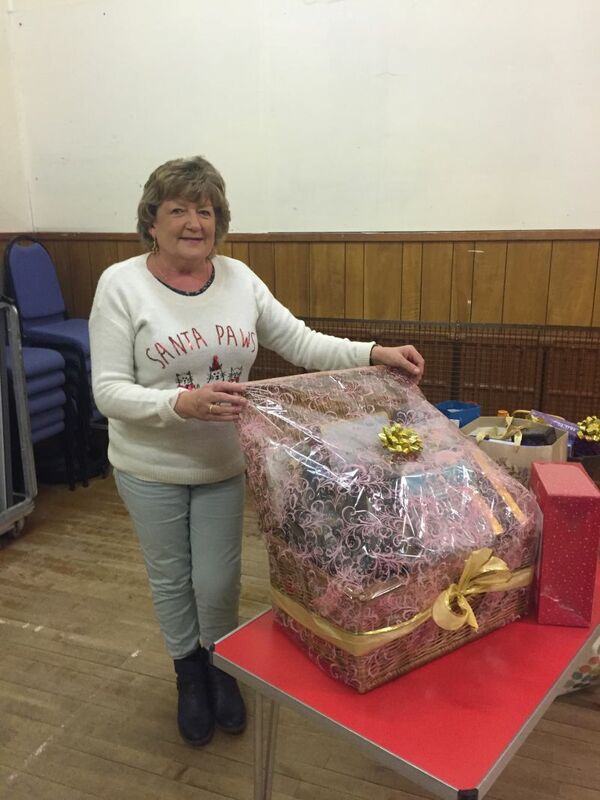 Patti would like to say " Many thanks to all who donated items for the hamper and to those who generously purchased tickets for the draw. 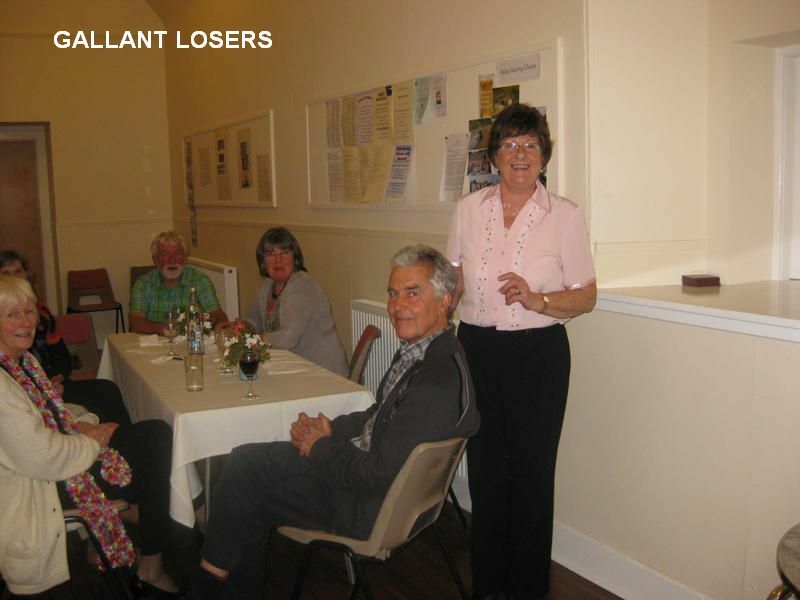 It was a very successful fund raiser". Thanks Patti very much for your hard work. Congratulations to Ainur on passing her driving test. pass or a "finally passed" pass!!! 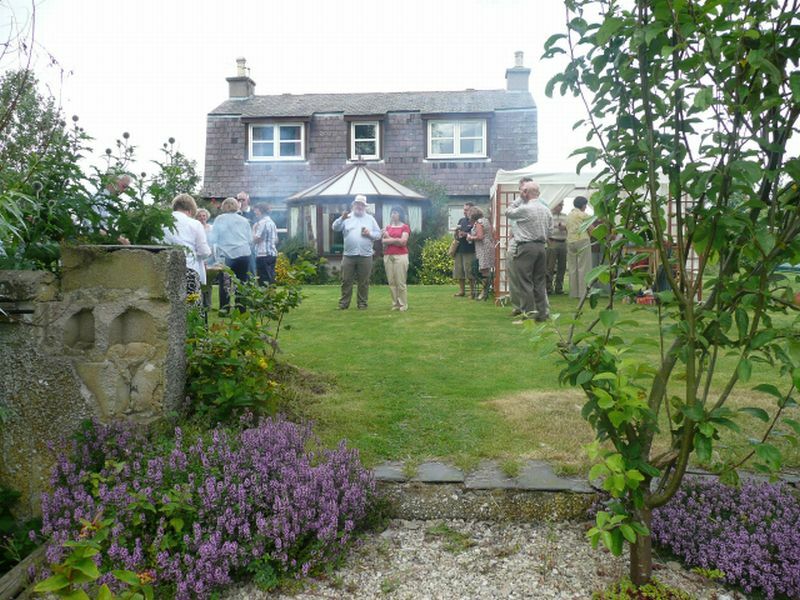 For once the weather was kind for our BBQ' once again held at David and Jane Rawlinson's. A little windy but that added to the flavour of the occasion. A little montage for your perusal. I haven't added any comments. I will leave that up to you!! 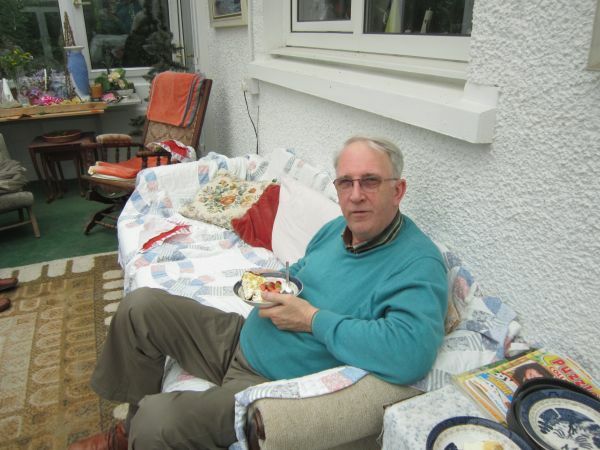 "An excellent website, John, full of info and interest. Keep it up! 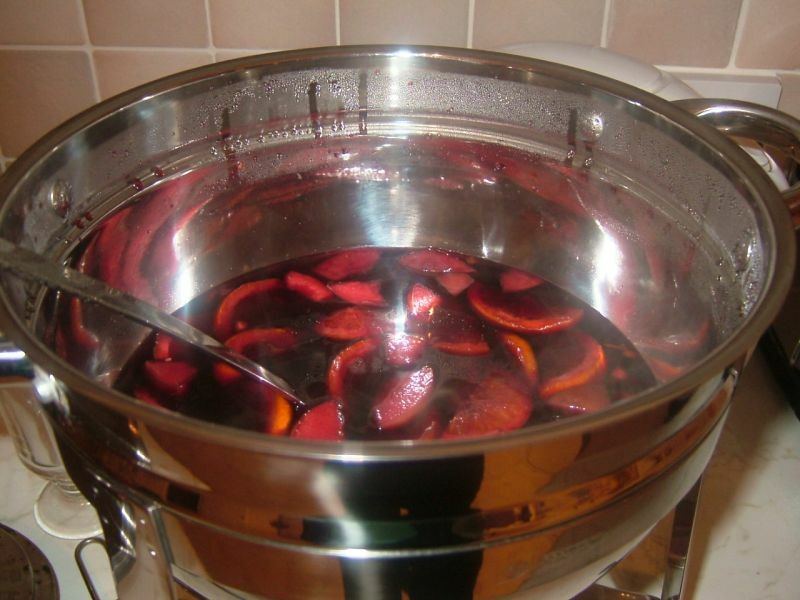 I am wondering whether with saturation bombing of my asthma I can try it again. 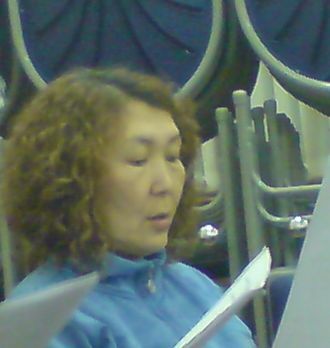 I so miss my singing but am very aware of the unacceptability of coughing in rehearsal, let alone performance! Maybe I should see if I can manage it…. I could always admit defeat again! 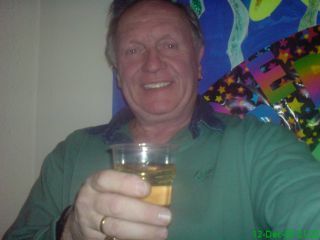 But re-looking at the website I see I shall be away in Spain for the final rehearsal weeks in February so that’s out after all. But we will be back in time for the concert, thank goodness. Give my best wishes to the choir, please. 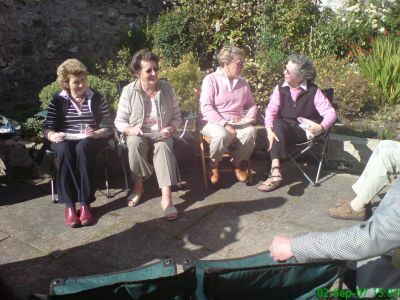 Sadly I had a previous commitment that afternoon so was unable to attend but I do hear that a good time was had by all. 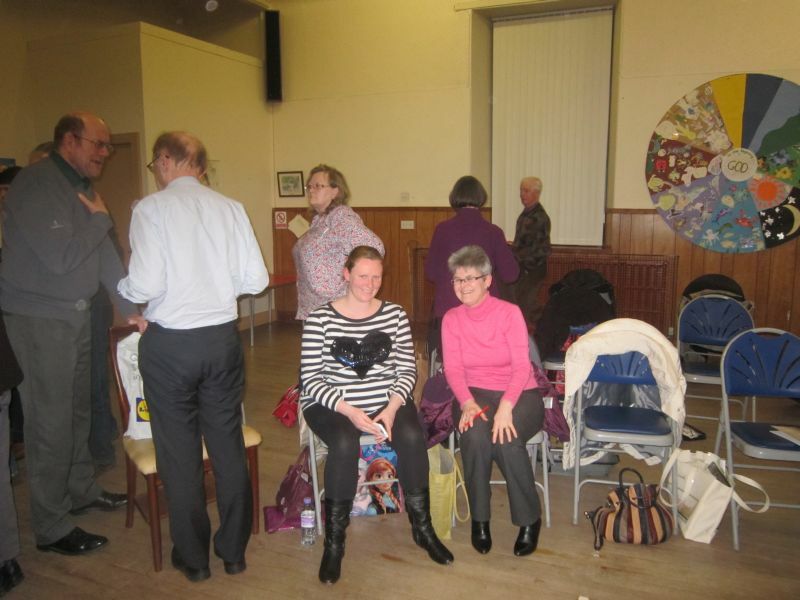 I know the weather was somewhat inclement but do we care at Inverurie Choral? Not a jot. 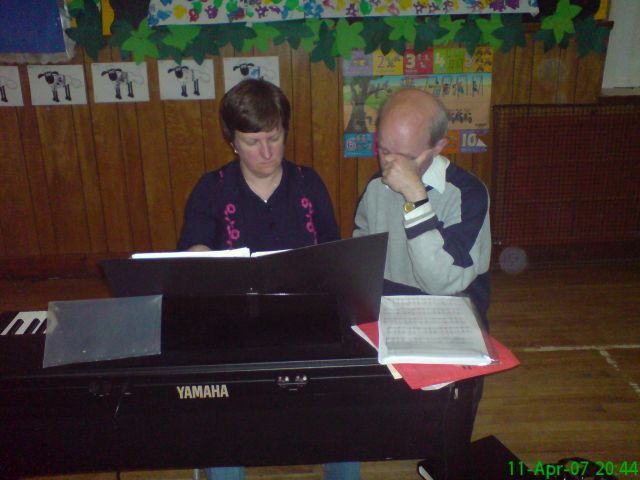 Its the friendship that is built on from the love of Choral singing with an interesting, fun but technically correct Musical Director (I will take my commission later Moira). 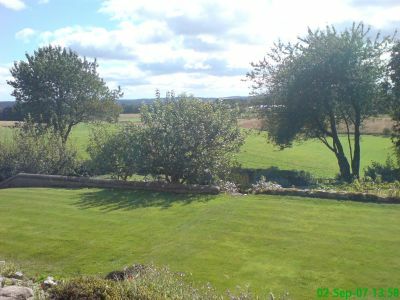 After a summer of excellent weather, we chose one of the few days when the weather was distinctly showery. 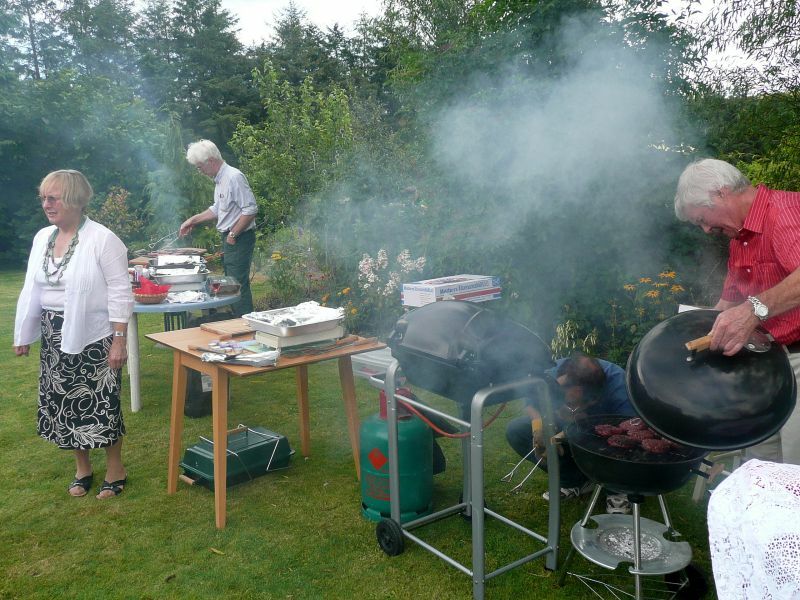 This did not dampen the spirits and everyone enjoyed the summer barbeque for choir members and their families. 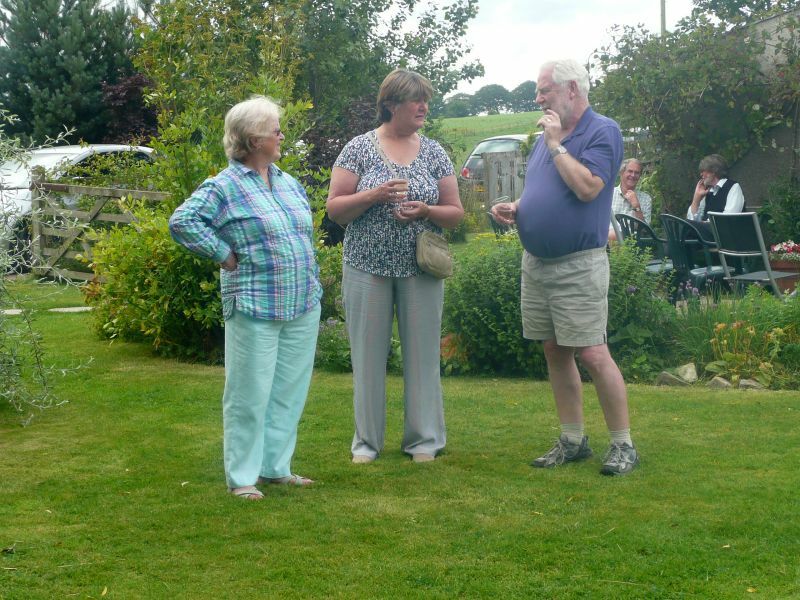 Jane Rawlinson kindly allowed us to use her garden and house for the event which meant we could wander around the garden, chat and enjoy the food. 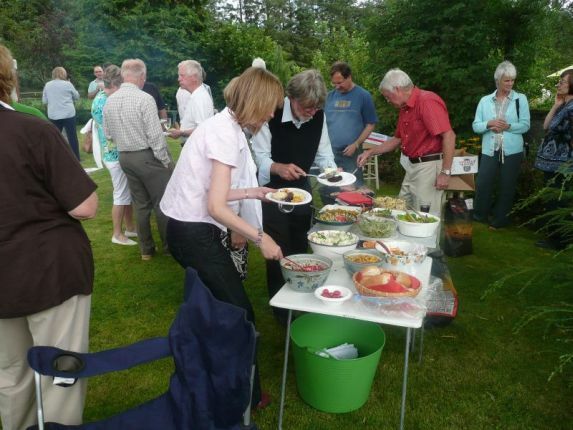 The barbeque items were provided by the choir as a thank you for all the hard work members have put in during this year. 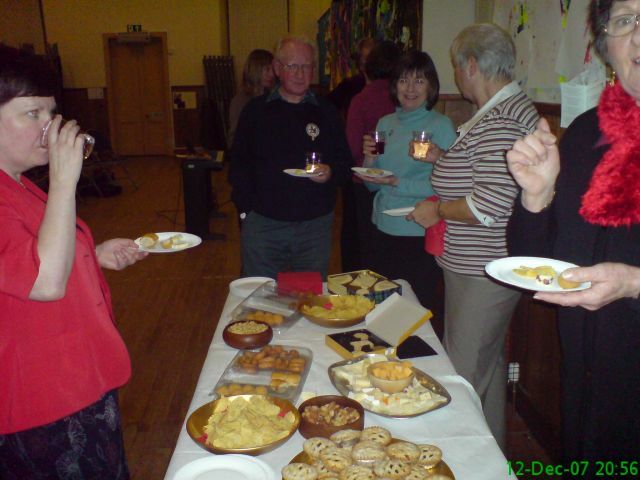 A large selection of excellent sweets and drinks were provided by the choir members. 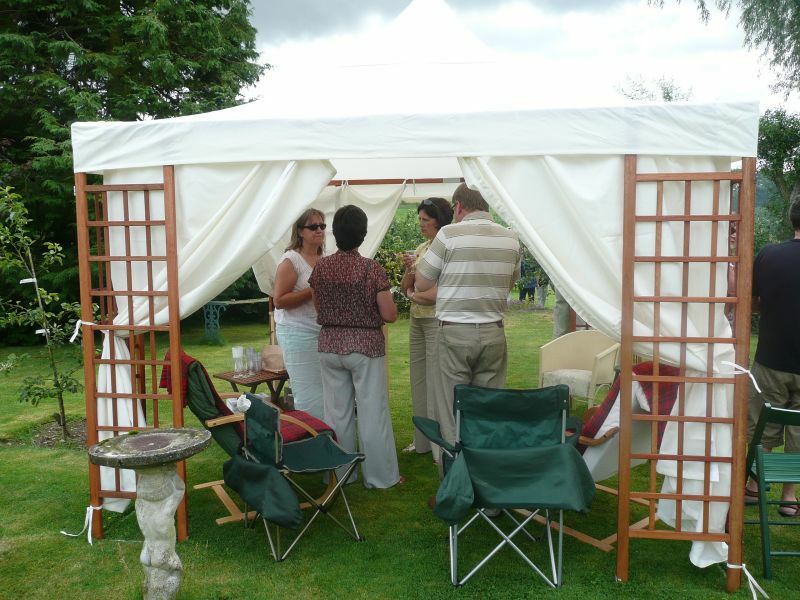 Christine loaned her gazebo to provide shelter for the bar area and a neighbour of Jane's, who plays classical guitar, played throughout the afternoon which made a great contribution to the atmosphere of the occasion. 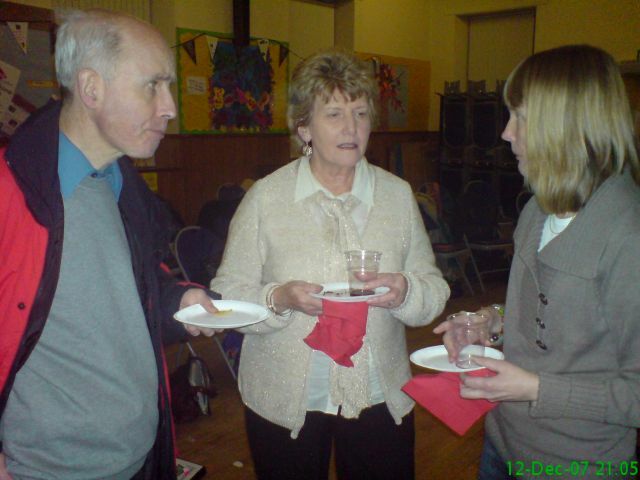 Jane's husband, David and Ellis, my husband found that they were both brought up in Bolton around the same time. The guitarist, Paul also turned out to be from Bolton too and both Ellis and David support Bolton Wanders (there is no accounting for taste - ed). Its a small world isn't it? 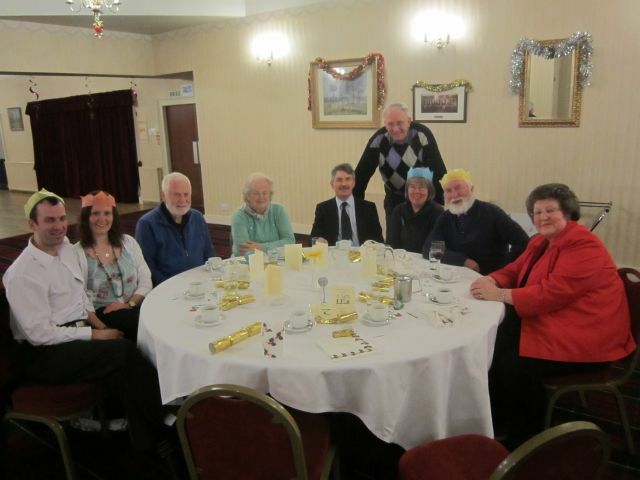 Many thanks to all who made the afternoon such a success. 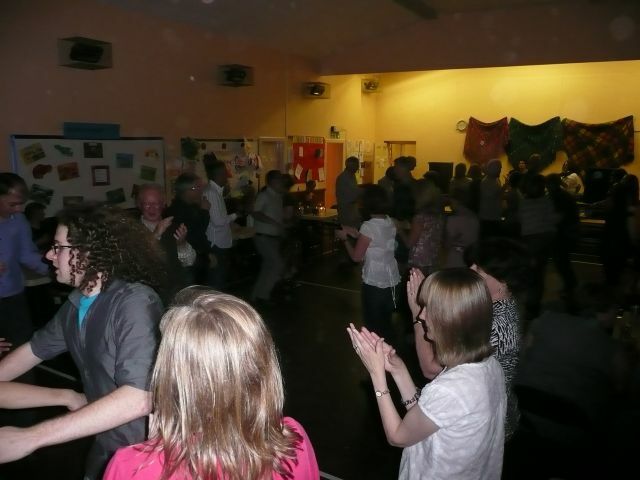 Again the Ceilidh turned out to be very successful. 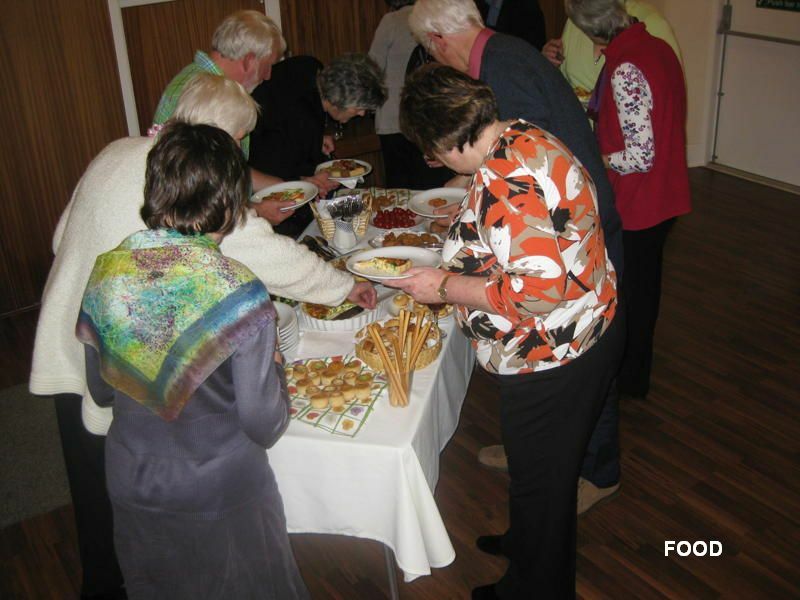 This has now become an annual event and each year has gone from success to success raising much needed funds for the Society. 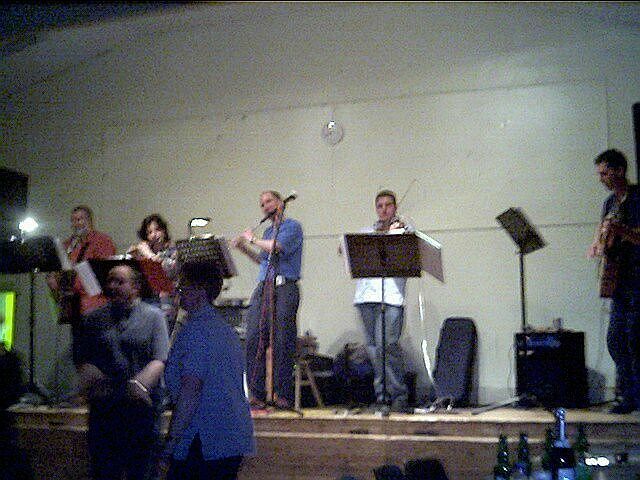 The excellent band for the evening was "Heugh", three students from the Royal Scottish Academy of Music and Drama Traditional Music Course, Daniel Thorpe (now there is a familiar name, Ann - ed. 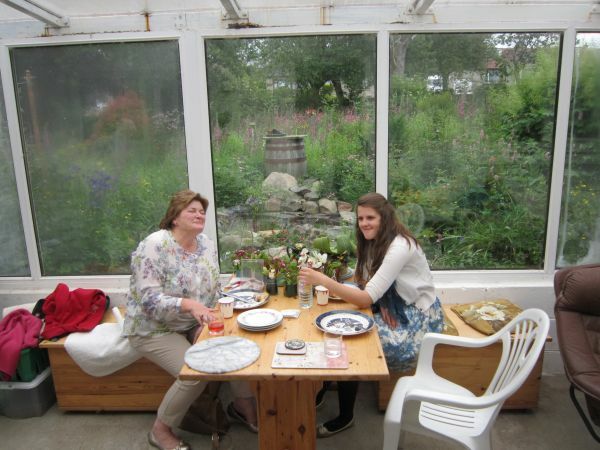 ), Ruariah McMillan and Innes Watson. 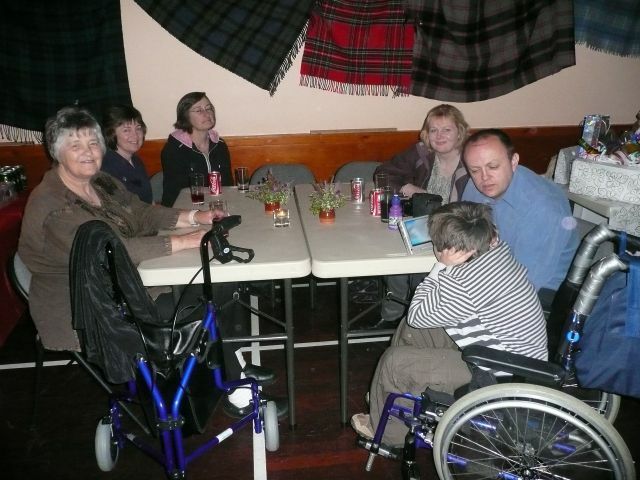 There was no need to persuade people to dance, from the opening bars of this exciting Ceilidh band the floor was never empty. 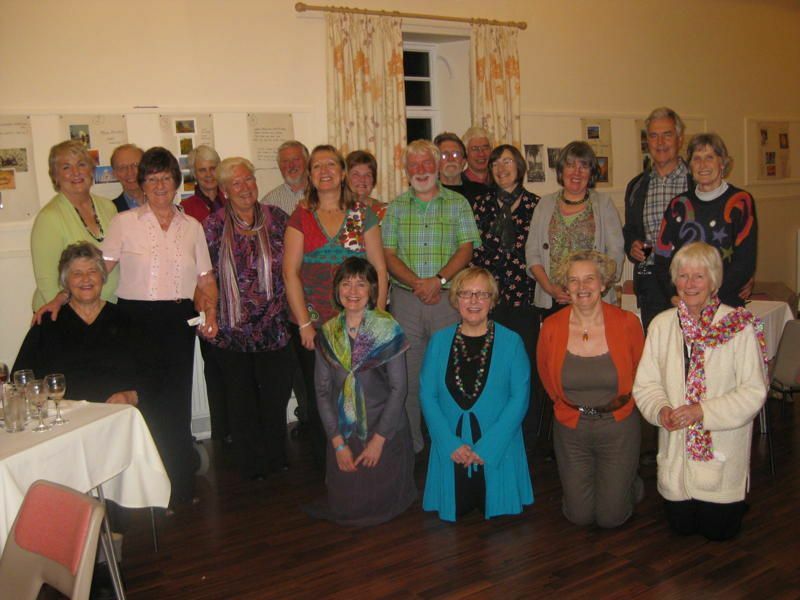 A feature of the Inverurie Choral Society Ceilidh is always the superb supper. 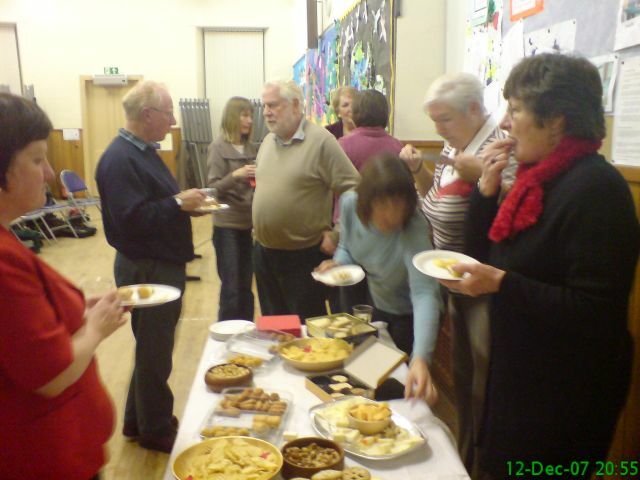 Dancers were served with a choice of six homemade soups, French bread and afterwards were able to choose from ten types of homemade pies, all provided by choir members. 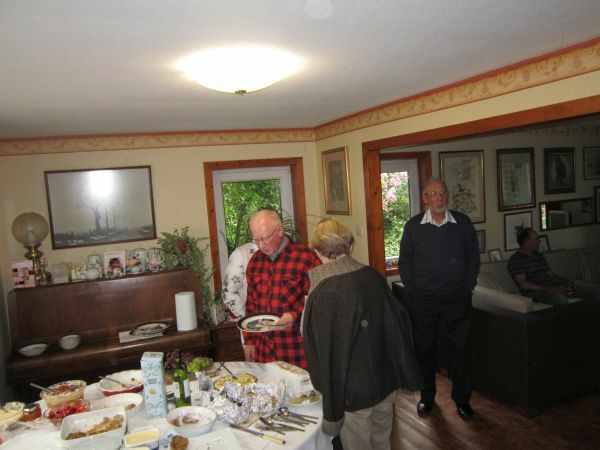 Many second helpings were served. 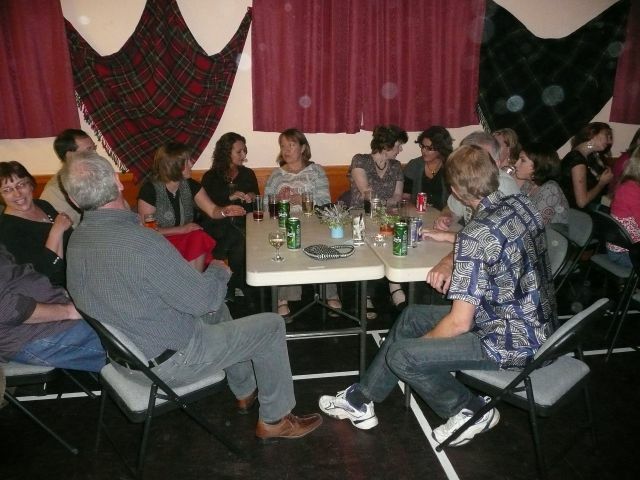 Everyone enjoyed the evening and left asking when we are holding the next Ceilidh. 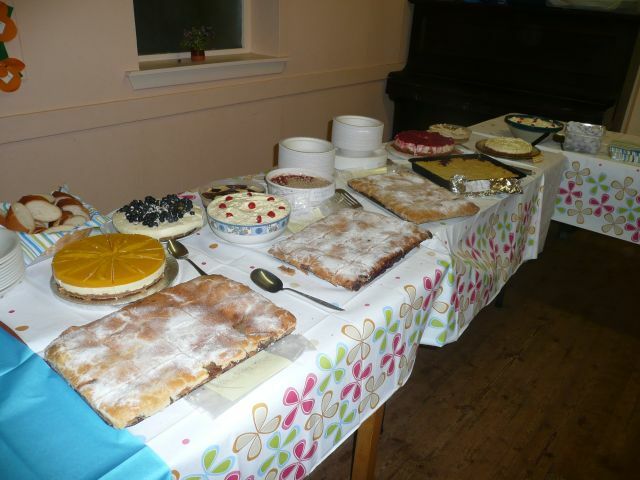 Thanks to all the choir members and spouses who contributed by making soup, baking, manning the bar and setting up and clearing the hall. Watch this page for future events. 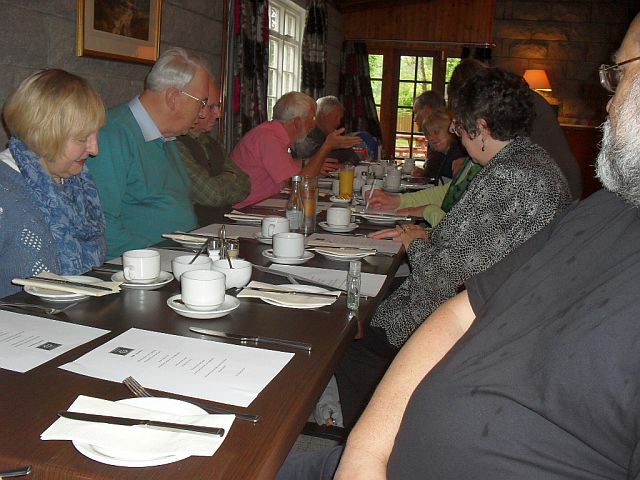 The Committee thought it would be a good idea to have a high tea booked at the Townhouse Restaurant between the performances at Inverurie Garden Centre and Castle Fraser. About 15 of the choir attended. We had a nice meal with the usual Christmas trimmings. Ridiculous hats and corny jokes in the crackers - where do they get them from? It was nice to sit down and not sing for our supper!! 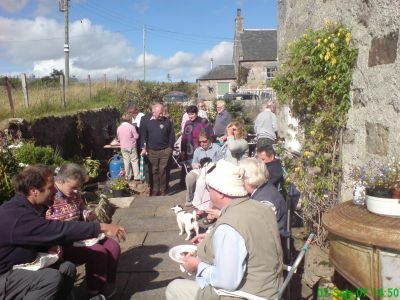 On a lovely summer's day, in the idyllic setting of our retiring Chairman, Douglas's, house alongside the River Don near Monymusk, our summer BBQ was held. The weather was kind, and as threatening clouds drifted away by the middle of the day one recalls the saying of "the sun shining on the righteous". Well half of the saying was right. 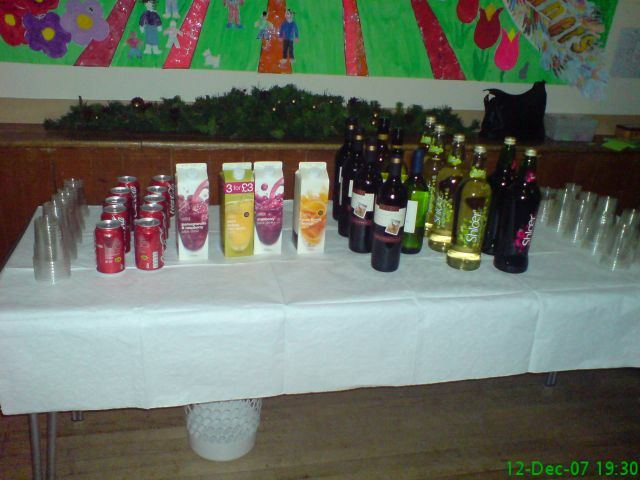 A well stocked barrel of iced drinks was provided for all. 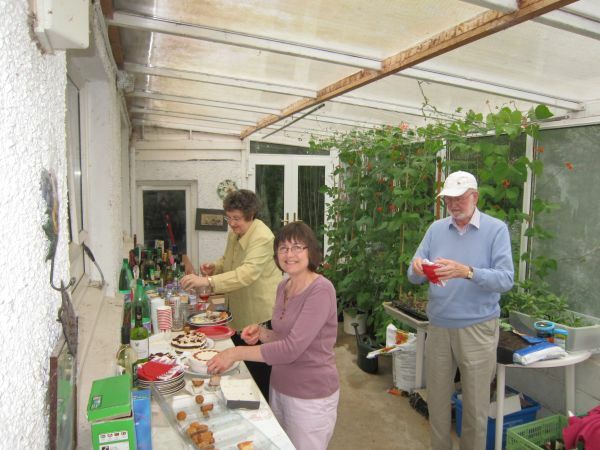 Douglas's family really turned their hands to the provision and preparation of food and drinks. 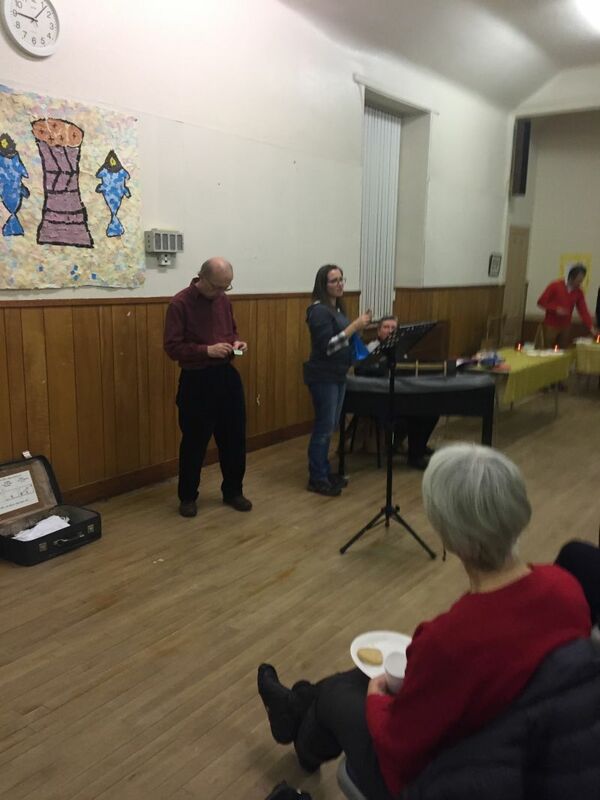 Each choral member brought along some accompanying food. 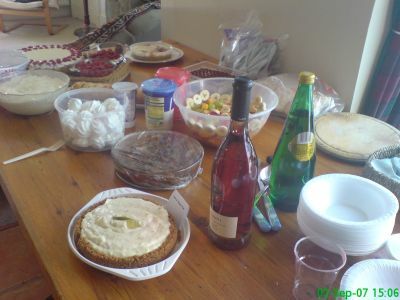 There was so much to eat and drink. 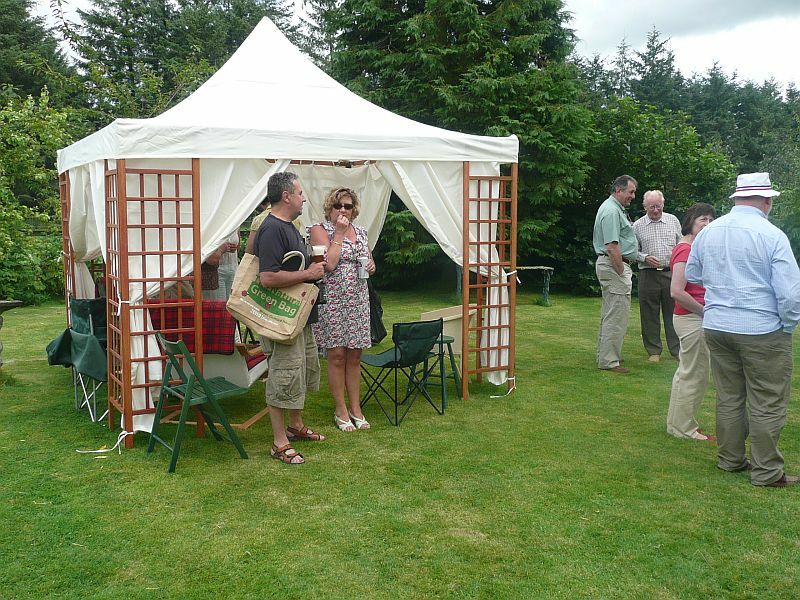 Even games were provided though from what I saw, the intriquacies of lawn croquet baffled most of us. 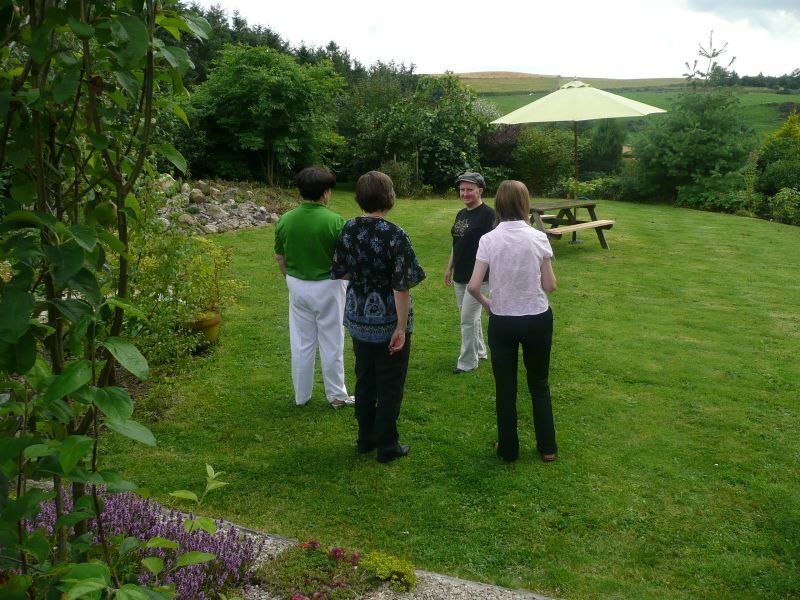 Douglas was instructing some of the children on the rules and regulations of croquet, but whilst admitting to not being an aficionado of the game, I am sure some of the rules were made up to Douglas's benefit. Now I could be wrong but I don't think so. 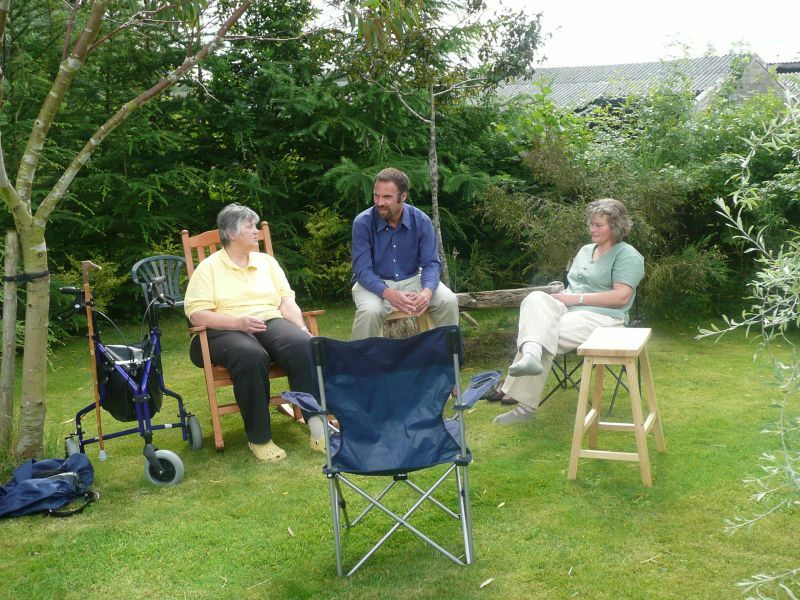 It was a lovely opportunity for everyone to relax in a beautiful setting and enjoy the afternoon before the day cooled with the onset of evening and the local "midgies". Thanks again, Douglas for your hospitality. 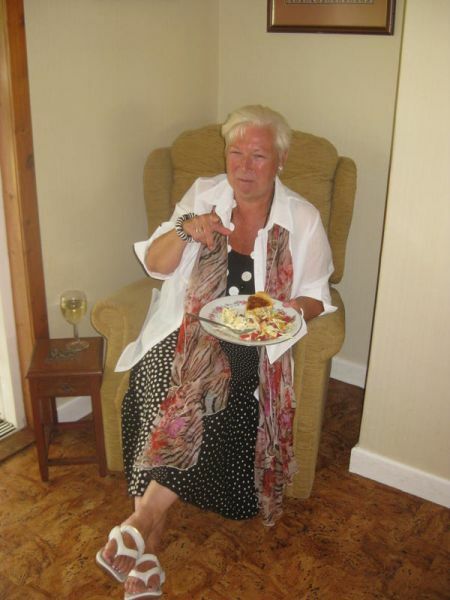 Jean Thornton very kindly provided a "Mince Pies and Mulled Wine" party at her house prior to departing South. 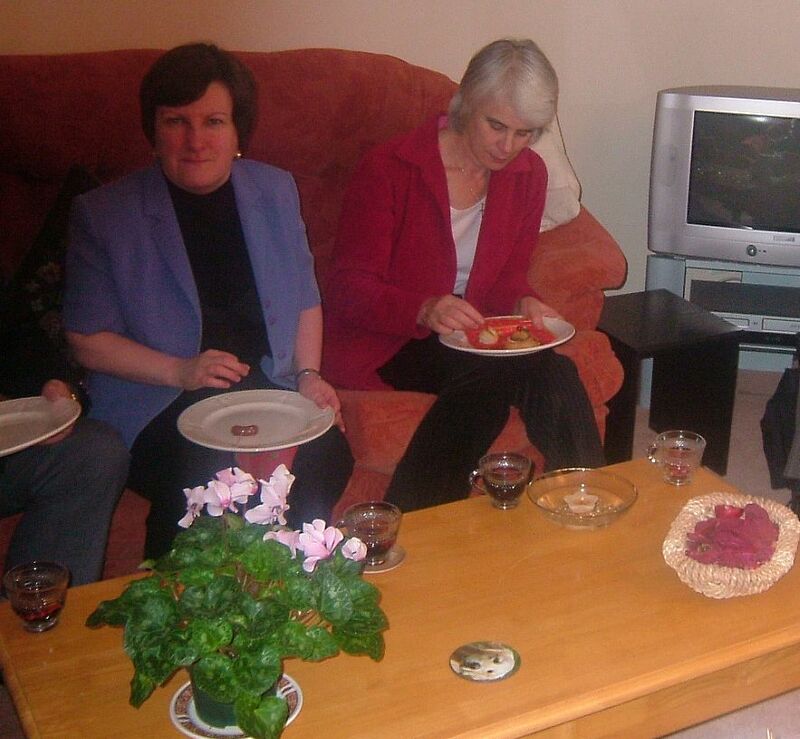 On a cold winter's evening (we recorded -10C on the way home), members of the choral enjoyed Jean's hospitality. 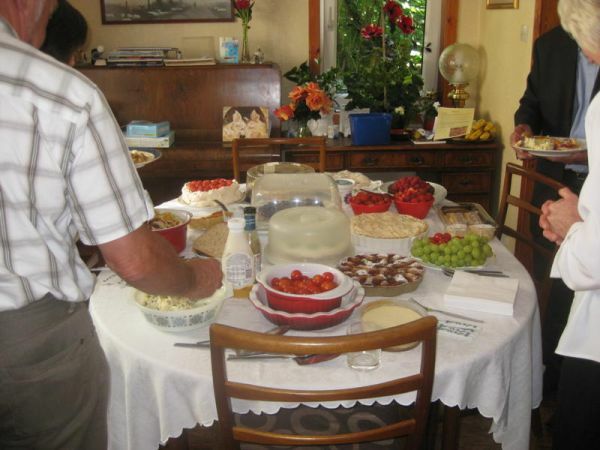 It was a truly magnificent spread and I know Jean won't mind me saying that it was provided by a local Outside Caterer. 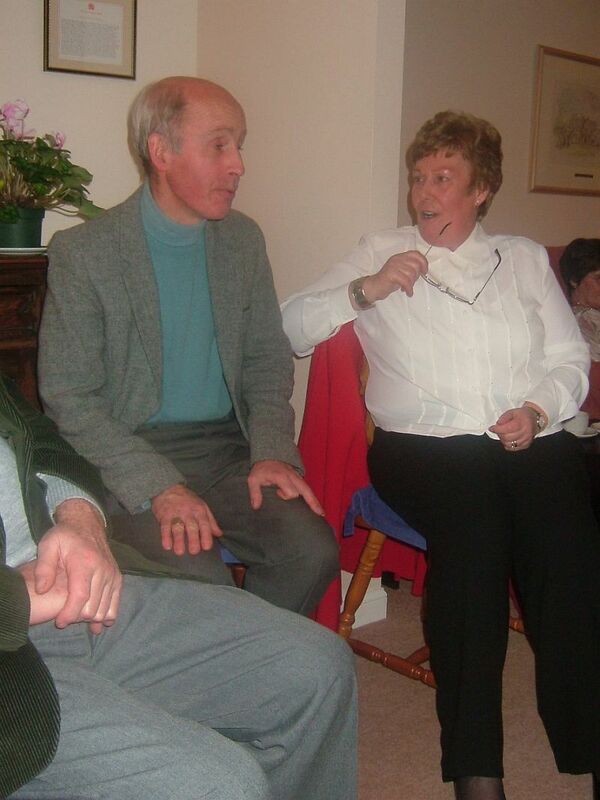 Are Nick and Jean chatting about something very important or just singing in harmony? 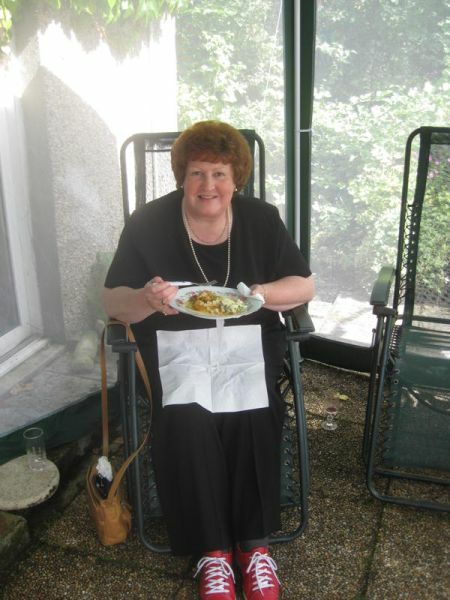 Jean looking pensive but "dinna fret, quine. Haste ye back!!!!" We will still be here. 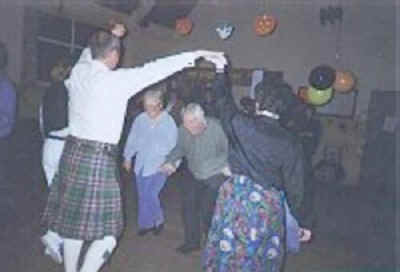 Ceilidh was held at the Daviot Village Hall on Saturday 12th June 2004. I am eagerly waiting for a report!! We had had a week of glorious sunny weather. One thing you can't guarantee in the North East of Scotland is the weather. Dawn the day of the Barbeque and the skies were grey and threatening. By lunchtime the heavens had opened. 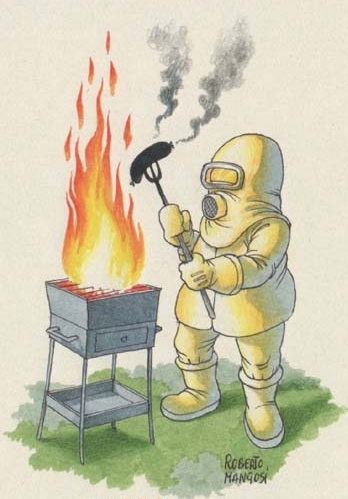 The BBQ was planned for 4 pm. By 2.30 pm, the first sign of blue skies were seen. By 4 pm, the afternoon had turned sunny and pleasant. 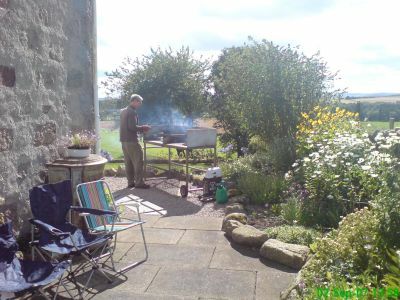 Funnily enough, looking back to our last BBQ on 9th June 2001, the weather conditions were virtually identical!! 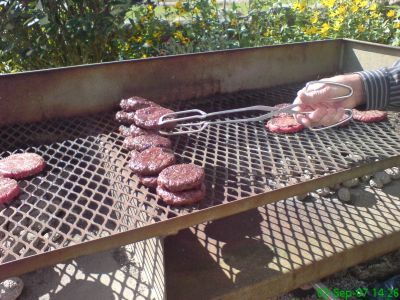 The tables were laid out, the food was ready and the BBQ's were lit. What a fine turn out. 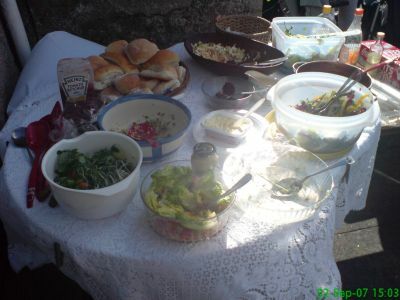 Sausages, Hamburgers and chicken legs were all barbequed and went along with the salads. The puddings were out of this world. Ladies, well done. 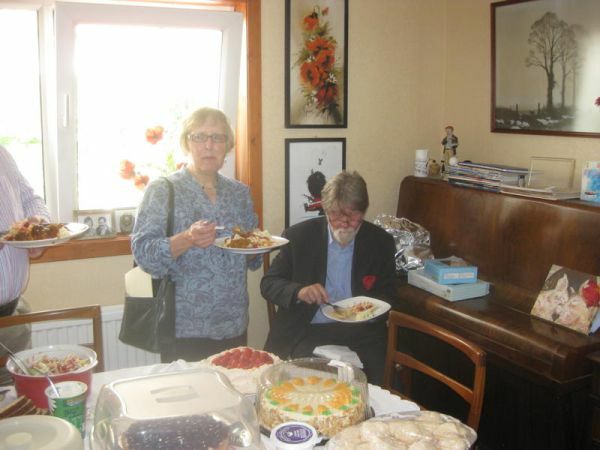 It seemed, and maybe this is representative of our Choral Society, that the sweet tooth prevailed and there were more sweets than salads though I didn't hear any of our soprano's or alto's complaining! After a steady start, our chefs got into full swing, turning out plate after plate of hot sizzling food. 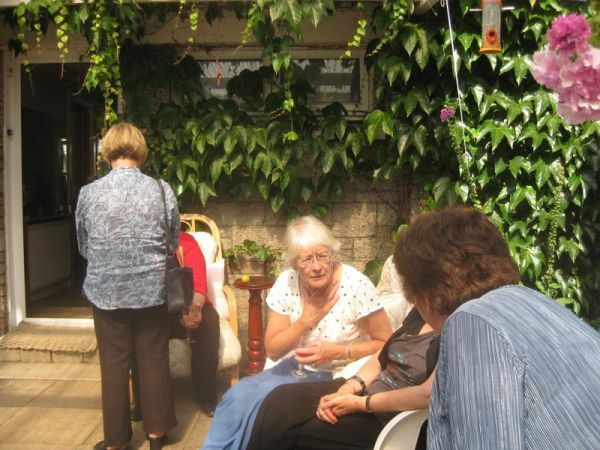 Washed down with a good supply of drinks, the afternoon turned out to be a friendly, cheerful afternoon. 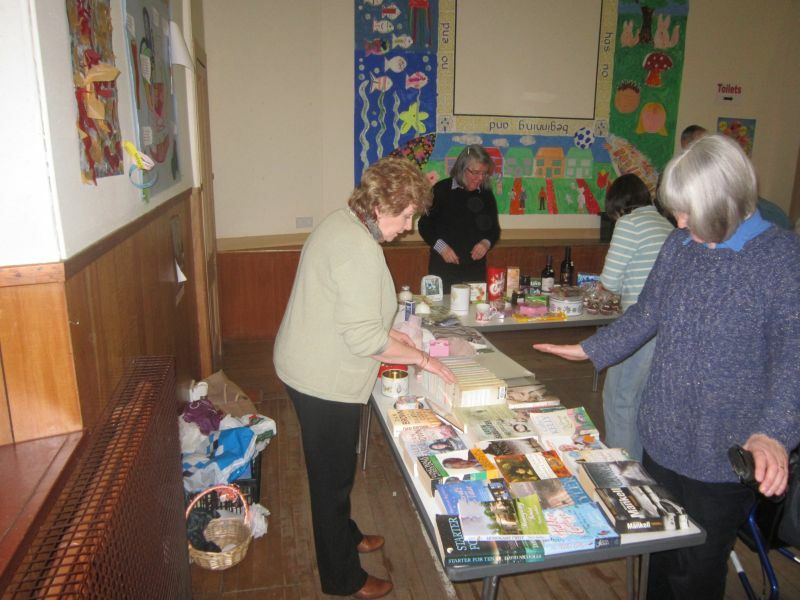 A raffle was held and the surplus food was sold off and a total of £180 was raised. 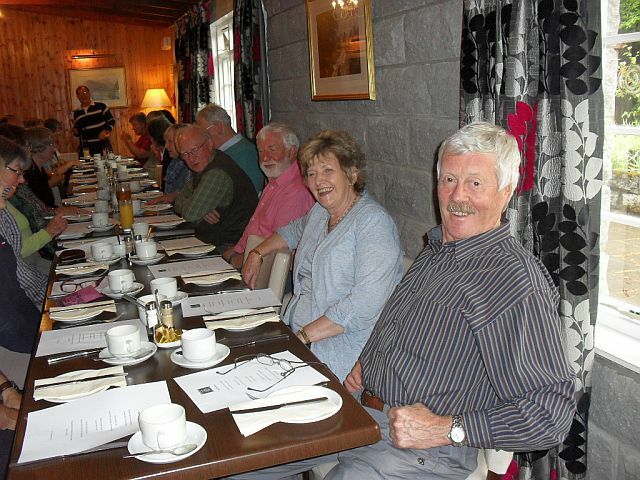 Thanks have to go to the Organising Committee and John & Margaret Hearne for kindly providing the location. 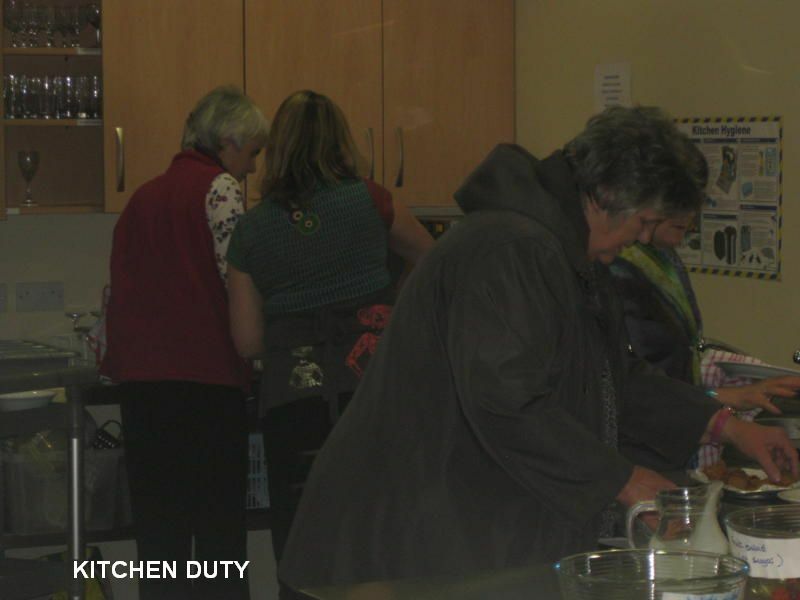 Thanks also to our chefs plus all other helpers for making the afternoon a success. 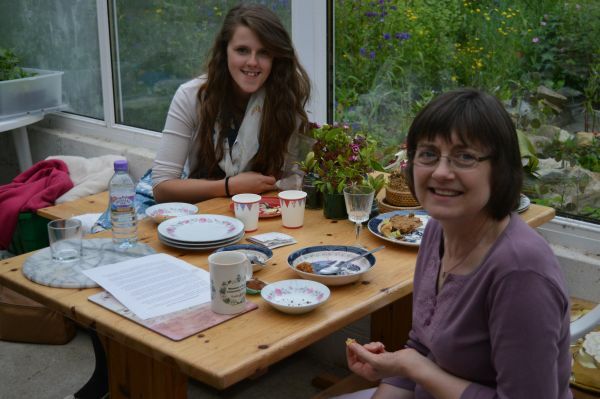 Everyone contributed to the afternoon and we all reaped the benefit. Well done everyone. Pat yourselves on the back. 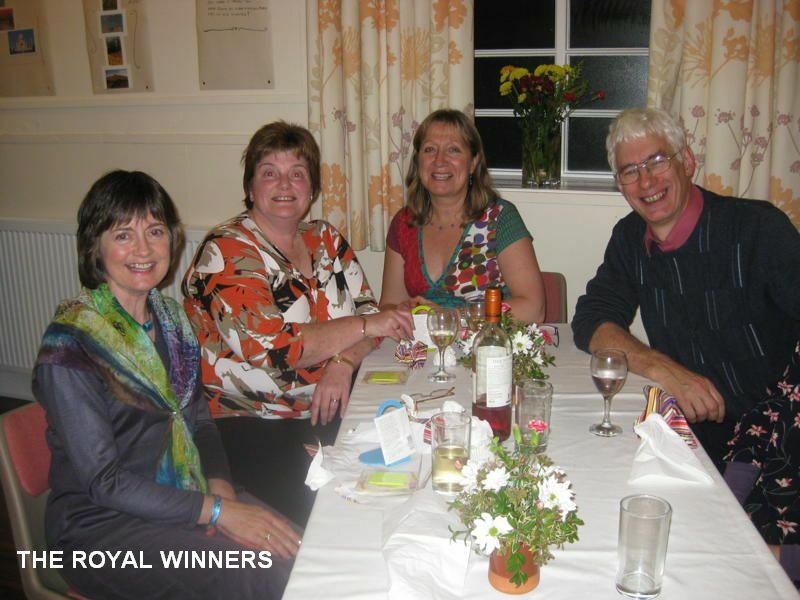 The quiz night, held in Fetternear Hall near Kemnay was the Society's first fundraising event for two years. It turned out to be a very pleasant evening. 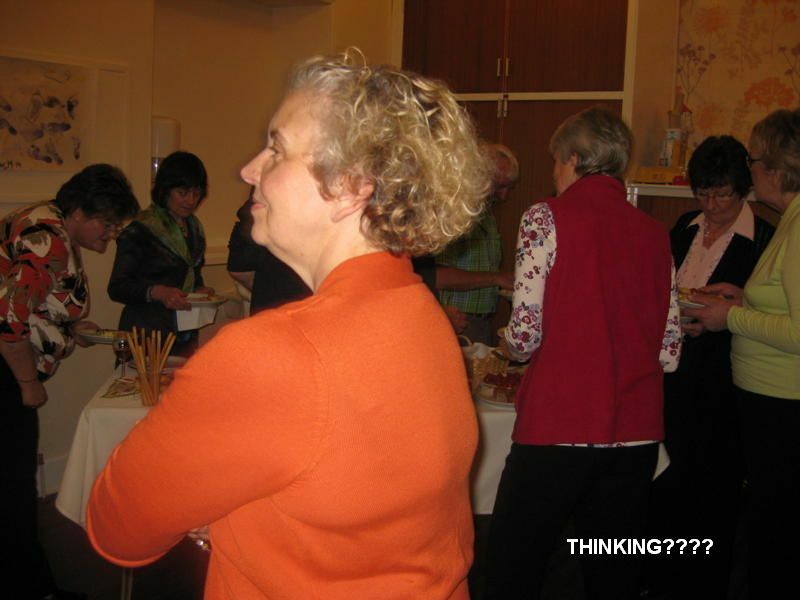 Teams gave themselves imaginative names from "More Crisps Please" (a reference to the free crisps available at each table) to "Cornish Pasties" (a group containing one of our tenors from Cornwall) and the questions began. 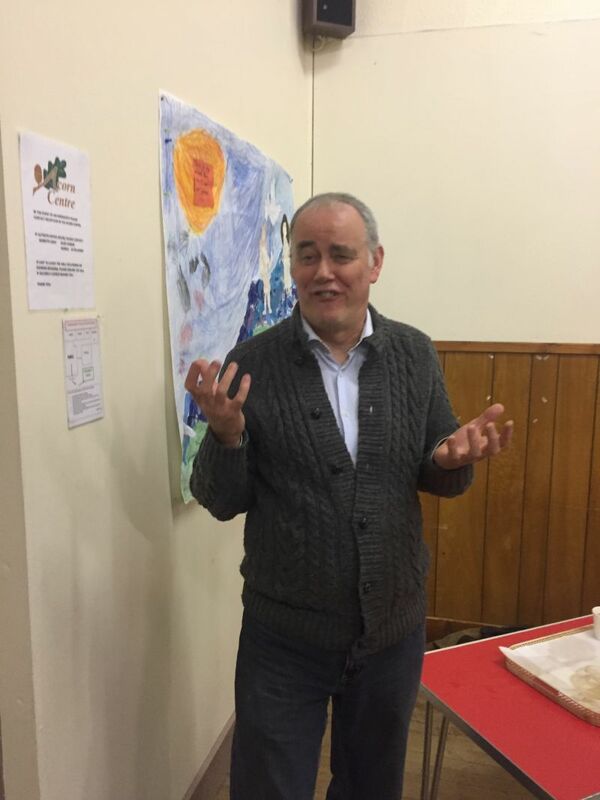 Aly McKay, husband of one of our sopranos was the Quizmaster who composed questions suitable for all age groups and ensured that the evening went with a swing, keeping everyone on their toes with good humour and panache. 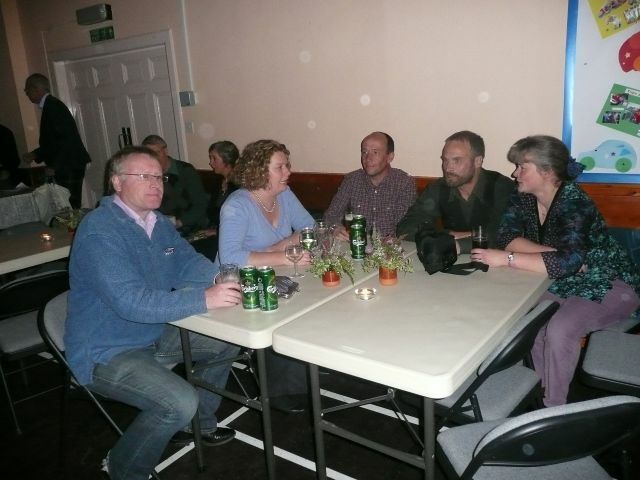 The bar was kept busy between rounds, everybody concentrating too hard to drink while answering questions. 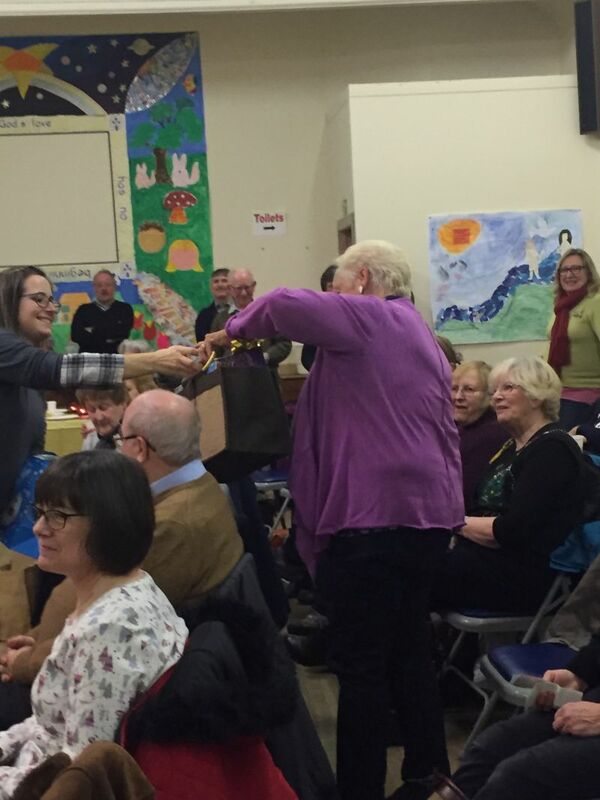 The raffle was drawn while participants enjoyed the home bakes provided by the choir members at the interval. 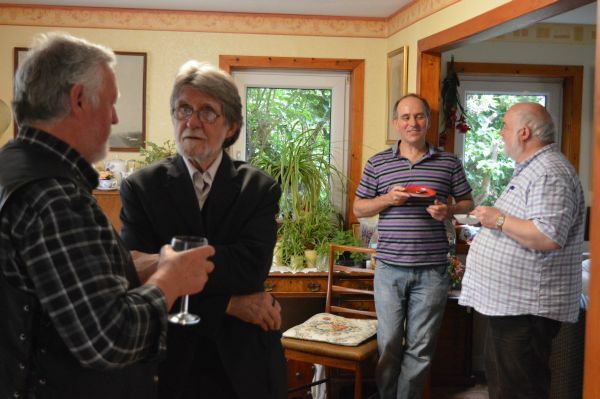 In all, a very good time was had by all. 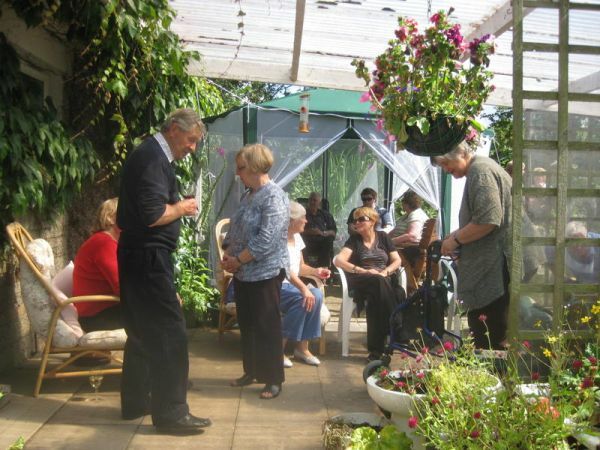 This could become one of our regular fundraising events. 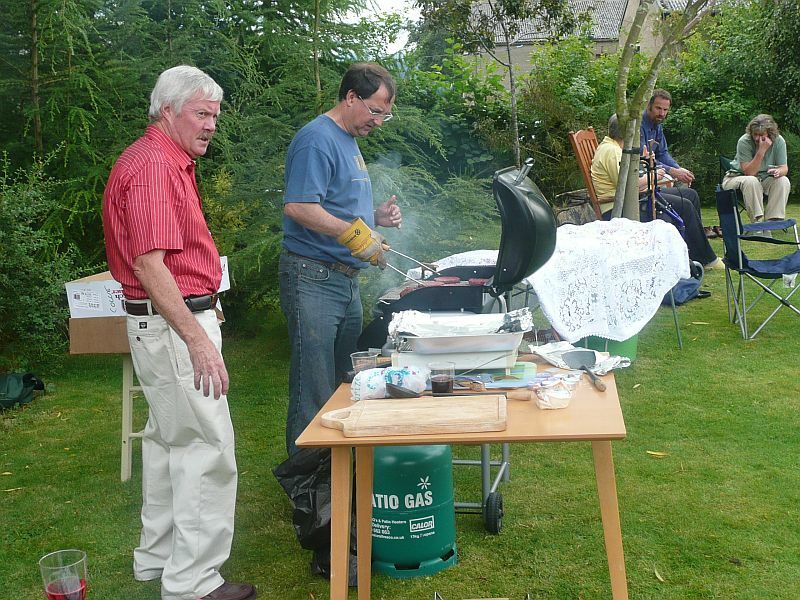 A barbeque was held at our Chairman Neil's home on Saturday 9th June 2001. The Saturday duly arrived and boy did it rain. 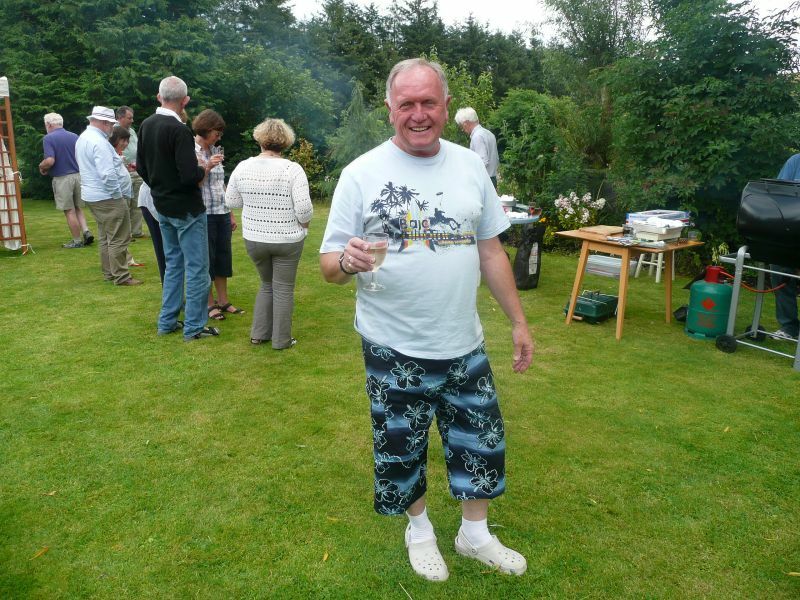 However, Neil had said that come rain, come shine there would be a barbeque on so there was. 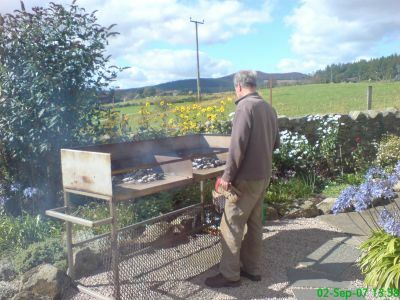 I don't know if Neil has connections with someone on high but about lunchtime , the clouds parted, the sun came out, the spirits lifted (knowing Neil probably in a glass) and the charcoal was lit. From what I heard there was a goodly crowd in the afternoon. I guess so because by the time Sandy and I arrived there had obviously been a hungry and thirsty crowd before us. Locusts is a word that comes to mind. 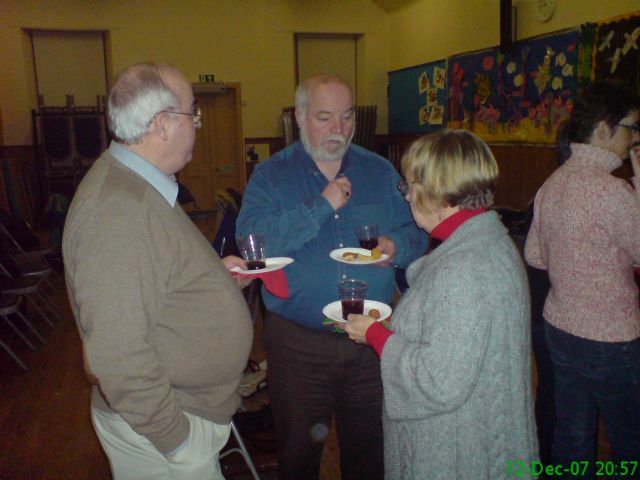 However Neil had a good turn out from neighbours, friends and choral though what I heard there could have been a few more choral members there!! 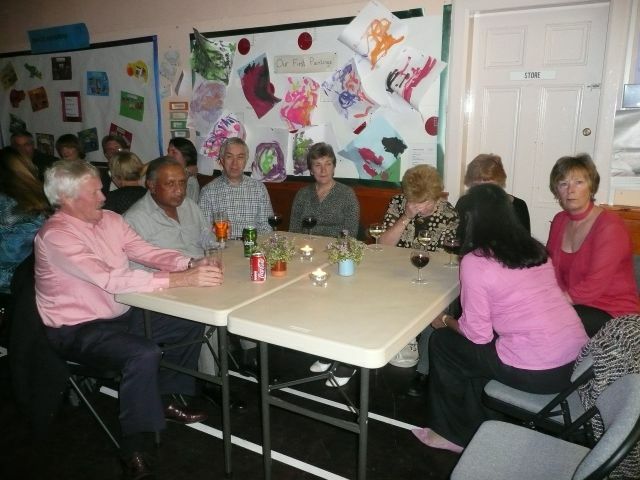 Remember that the social side is also an important part of a society. 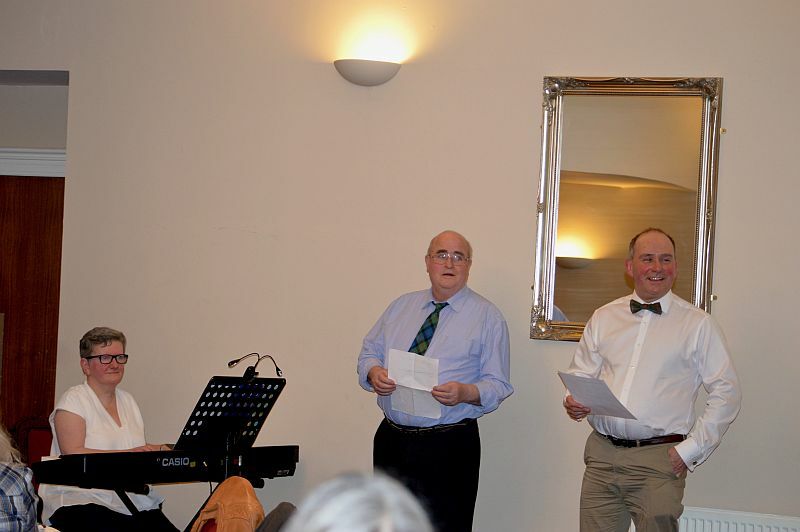 Yes we all love singing and the company and the comradeship. 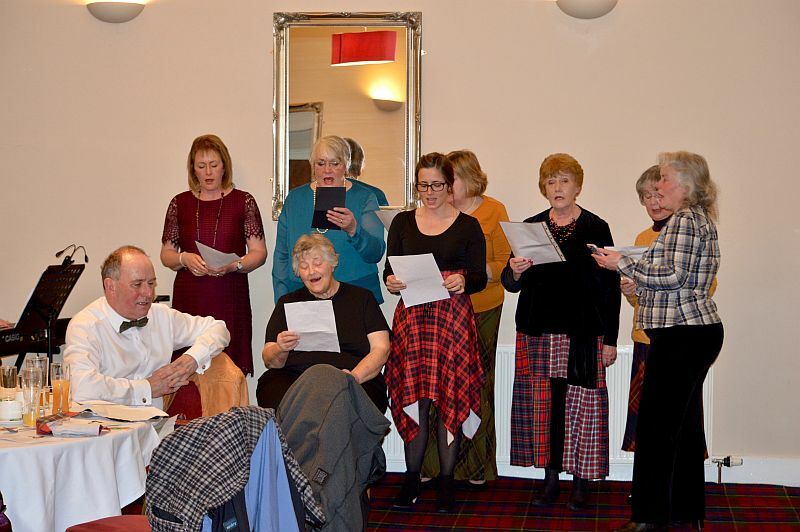 A Burns Night supper was held in Oldmeldrum for the members of the Society. 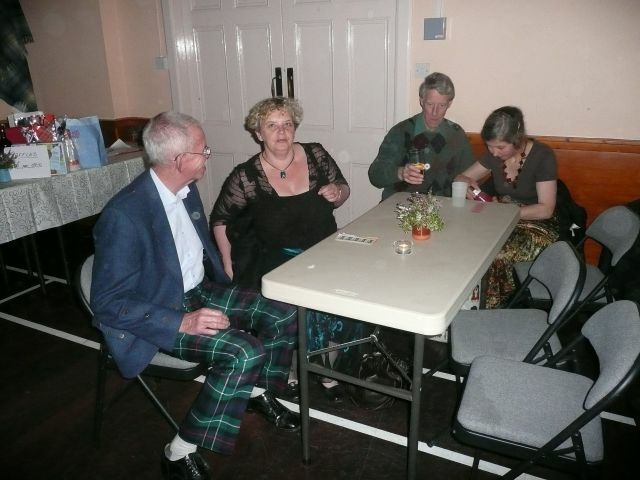 Even though the author wasn't there (somebody had forgotten to tell him about it - and I wanted to show off my Cornish Kilt! 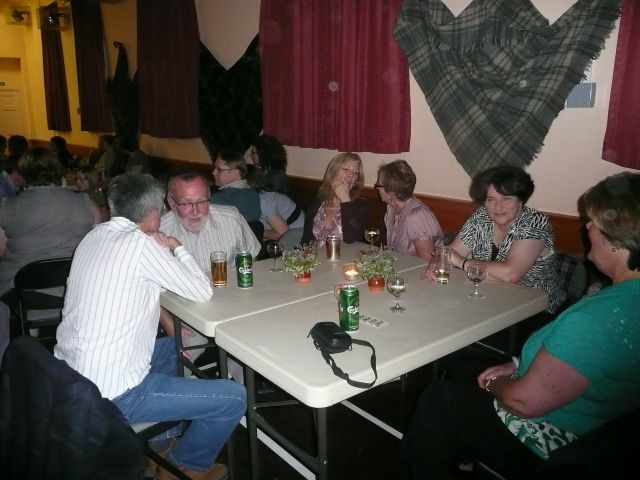 ), rumour has it that it was a brilliant evening followed by quite a few muzzy heads the next day. 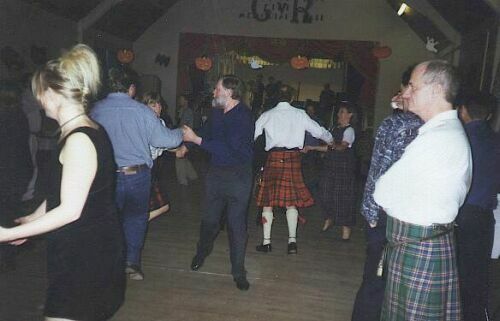 Our first social event was a Halloween Ceilidh which was held at the Chapel of Garioch on the 31st October 1998. 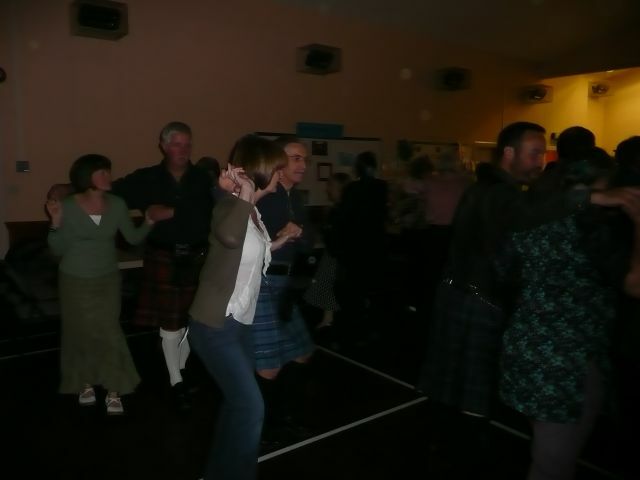 We danced to the Ceilidh band "Annasach" which had come up from Edinburgh for the occasion. 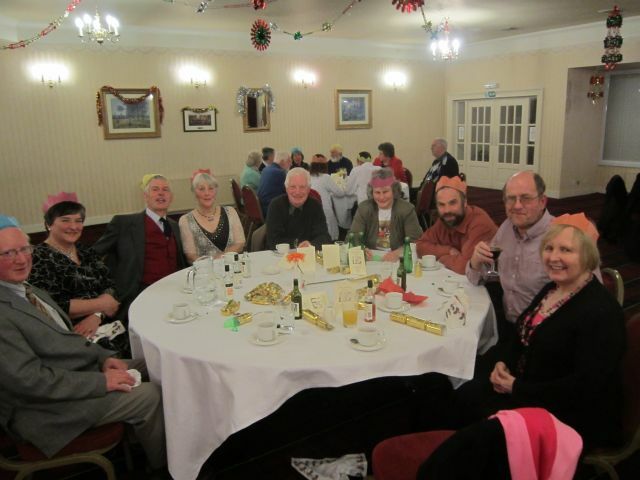 A good turn out of members and their friends (plus a bar and food) ensured a good night for all.